This project was started September 2007. After the GTR I really had the bug for japanese performance cars. I wanted something that was a not too common on the scene already and looked the part. 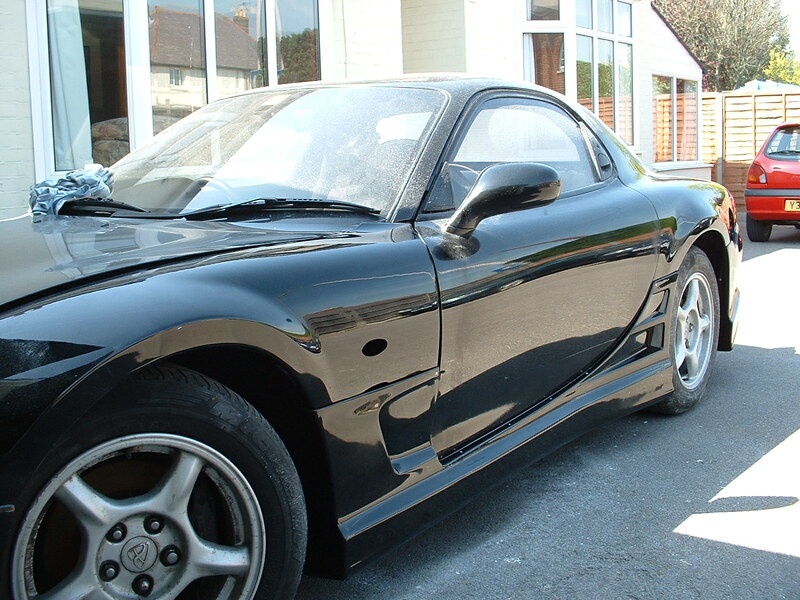 The RX7 certainly ticked those boxes and certainly had the performance potential. After doing a bit of research and unsuccessfully trying to source one direct in Japan one came up on ebay of all places! It looked like a lot of work but seemed like a good base for what I had in mind at the time! The car was bought as a rolling shell with a carpet and dashboard in tact. 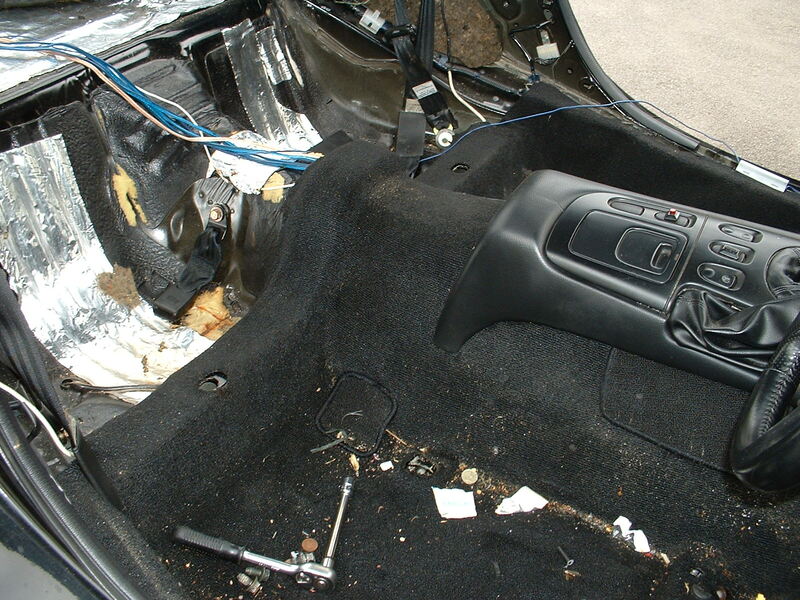 The rest of the interior was either missing or in the boot along with a floor pan full of bits ‘n’ bobs from all around the car where it had previously been stripped down. This was my first project on this scale since the RS turbo. In some ways I wondered if I had bitten off more than I could chew having never seen one up close before or had any real background of one. Now was the time to start learning! 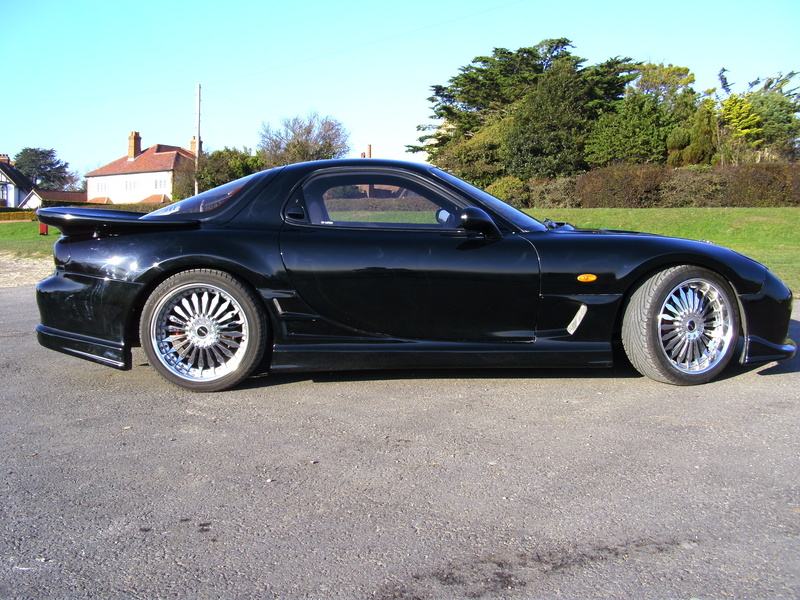 I had seen many examples of the RX7 online and for the most part these had aftermarket wheels and bodykits. I wanted mine to stand out and be a little different. 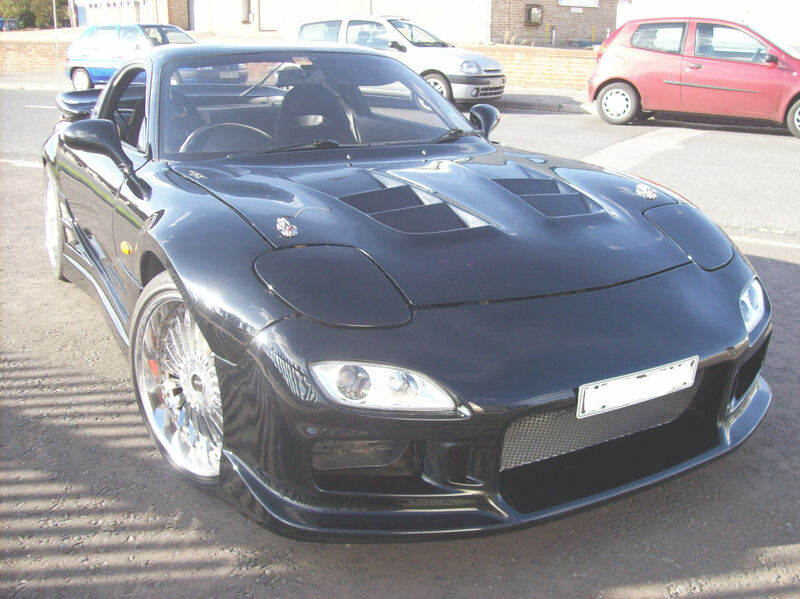 Reading more I came across the ‘wide body’ kits and these seemed quite rare. In particular a kit available from the US Shine Auto Project took my fancy. The KS Auto Burnout Kit. 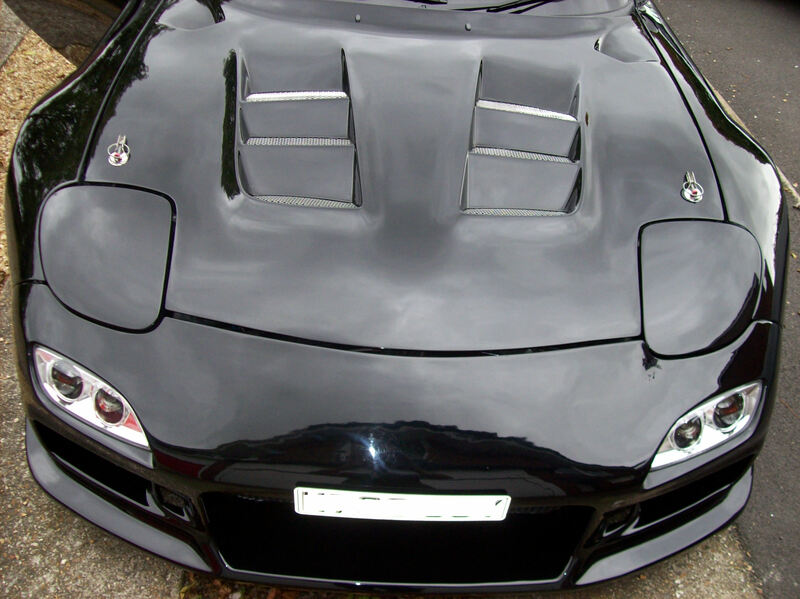 The kit was fairly subtle and really complemented the smooth lines of the RX7. Just what I needed and better still I could only find a few examples in the UK. So I set about trying to source a kit for a good price along with some wide wheels which I was going to need to fill the 20mm+ on each corner. Before I got to carried away I needed to find some bits to complete the basic car I had.. 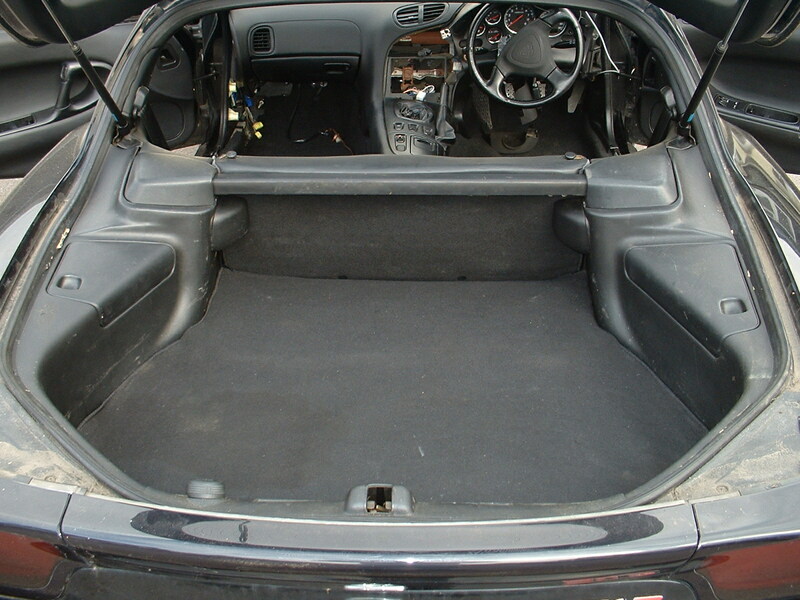 Mainly and engine and gearbox but also I required part of the rear seats and other missing interior trim. Plus a heap or other small parts I would only find out about when I started trying to put it all back together. 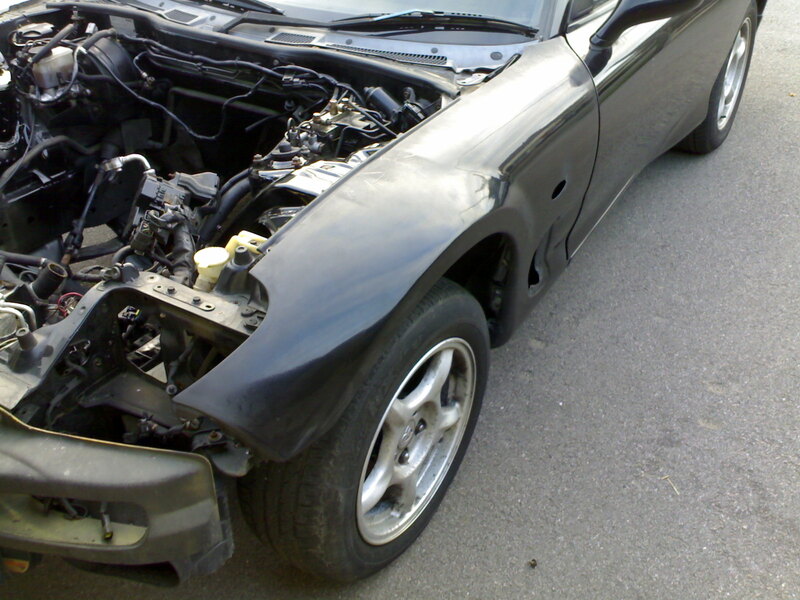 As ever I seemed to strike it lucky and a breakers pulled in a badly damaged 1994 model RX7. All the parts I needed where there and in good shape and the clock was only showing 55K which was no doubt a mixture of miles and km so I set about stripping it down carefully trying to make mental note of what went where and in what order! In only a day I had managed to strip the interior from one car and successfully swap most of it into mine including a quick valet! I was very pleased with that! 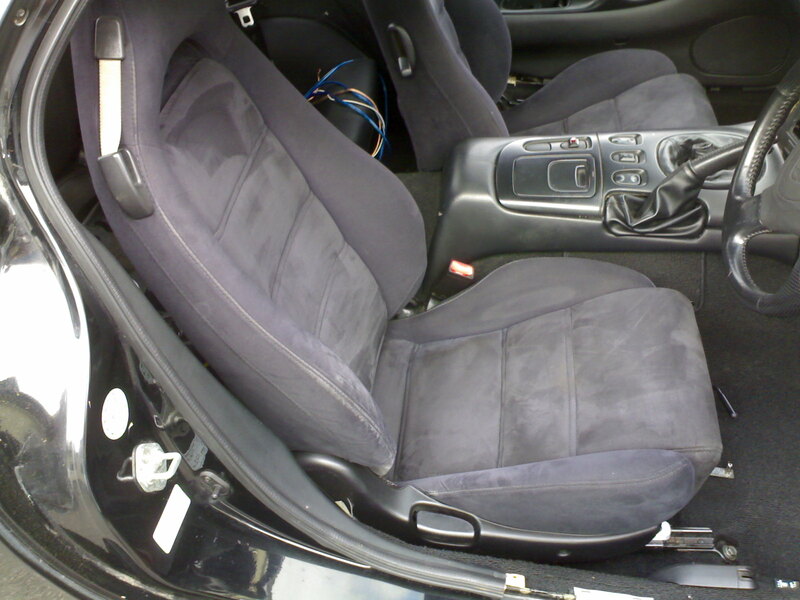 First time I tried to get in the car, now it was all emptied out and I could move the seat, I came across a bit of an issue. I could not fit in! My knees were unable to get around the steering wheel no matter what I did. Granted I am not short at 6’3″ but still, this was a first! I would have to find a way around this one pronto.. A small steering wheel was first on the list but would not do the job alone. After a bit of head scratching I devised a way to extend the seat rails to move the seat further back. 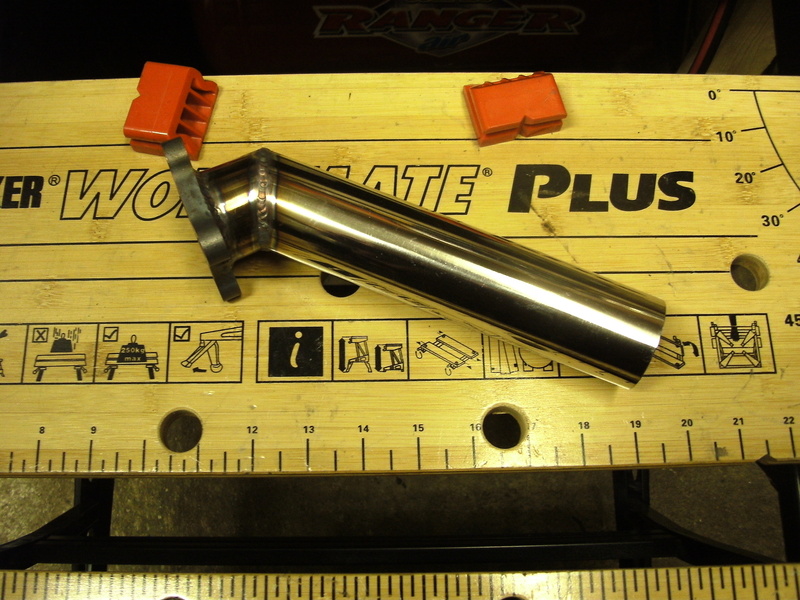 I took some measurements and created a CAD model to be sent off for machining with a local shop I used through work. 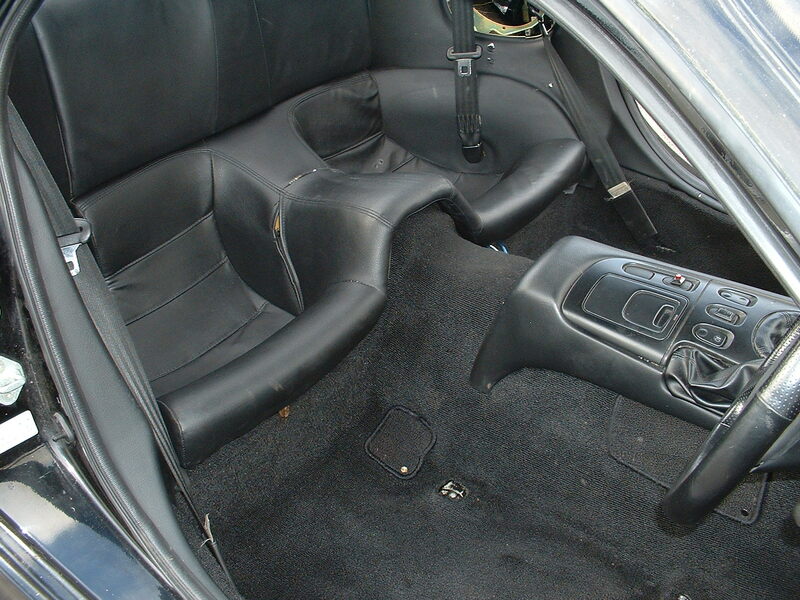 With these fitted the seat runs right back to the rear seats and gives ample leg room. I was going to market them as the ‘R-X7ension’ with a play on the ‘7’ replacing a ‘T’! Now I was able to sit in the car it was a bonus! and I was a bit more inspired to progress the project along. 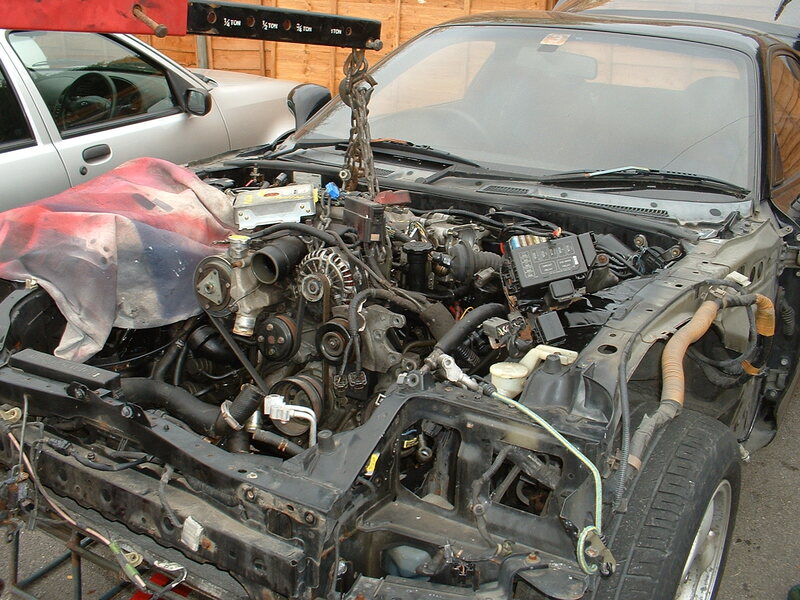 first plan was going to be fit the engine and get that running before I ploughed to far ahead doing other bits to the car.. just incase I came across any big problems. Before I could do that the engine bay needed a freshen up. Out came the steam cleaner for a thorough going over. I then degreased it as best as I could and masked everything out. 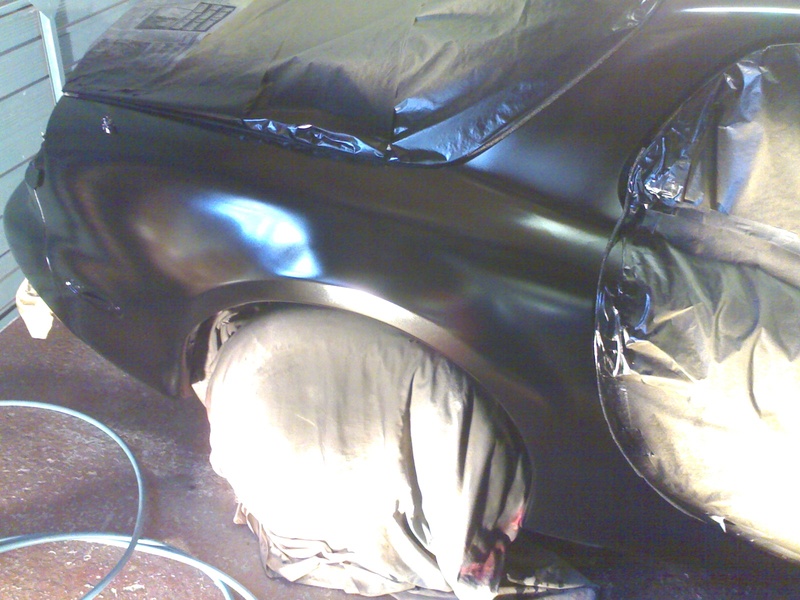 I covered the bay with a direct to gloss Mazda black. Voila! All shiny and new! 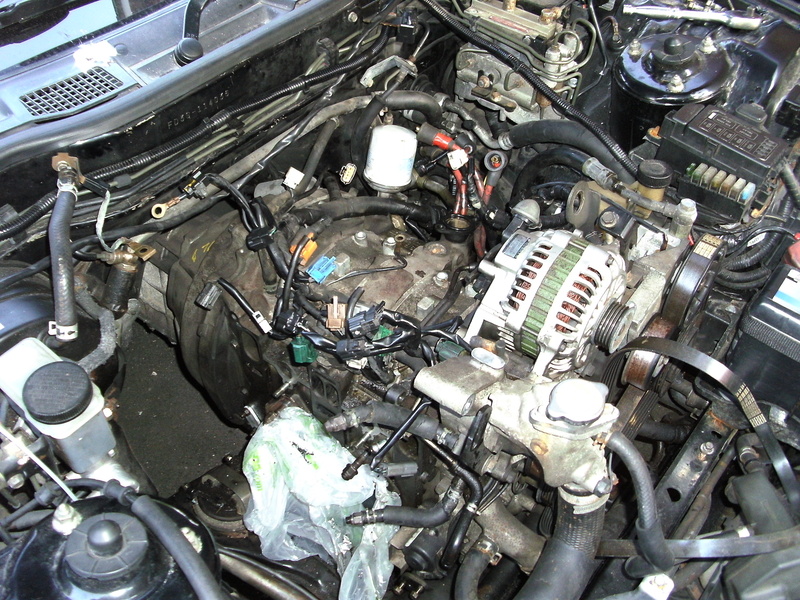 Now I would just have to be careful dropping the engine back in and not on the engine bay! 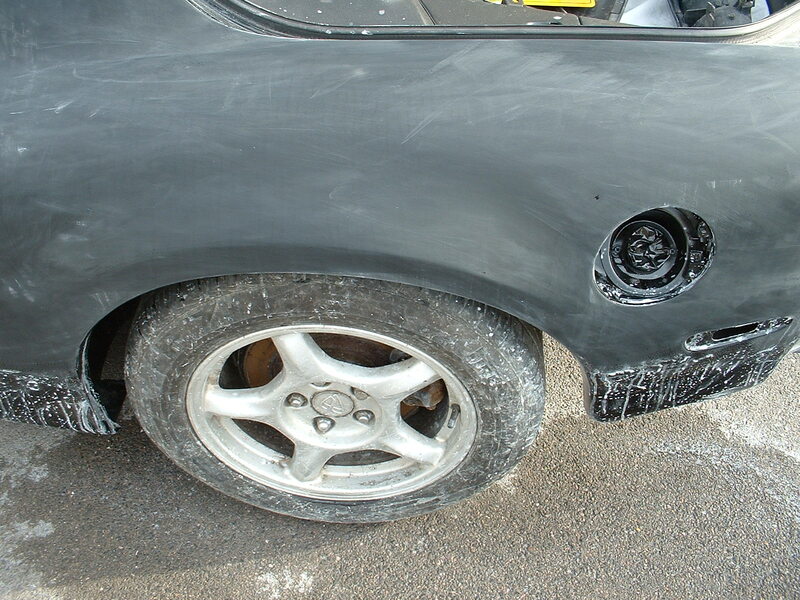 In the meantime I had managed to source a set of burnout fenders and rear arch flares in the UK. I was now stuck with what to put with it.. I could not find any burnout bumpers or skirts anywhere. I got some veilside spats and sideskirts as they were going cheap to see if they would work with the kit but they definitely didn’t. After lots of looking online I finally decided a C-west kit was going to be a good match and also give me some of the other lines I had in my head. 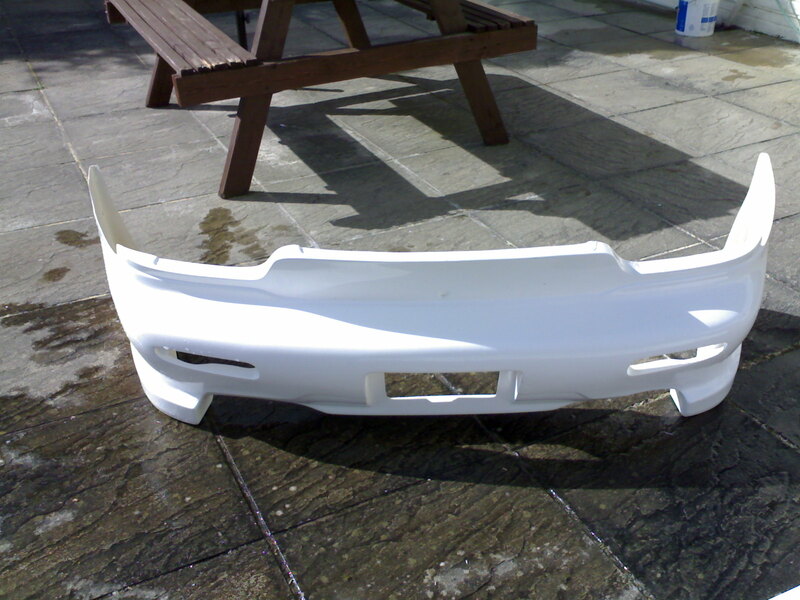 I managed to find some bumpers and skirts going on eBay without too much trouble. On top of the C-west Kit I was now going to need 99spec lights for the front bumper, which were easy enough to source and, I felt, some kind of rear wing. This was my next dilemma! 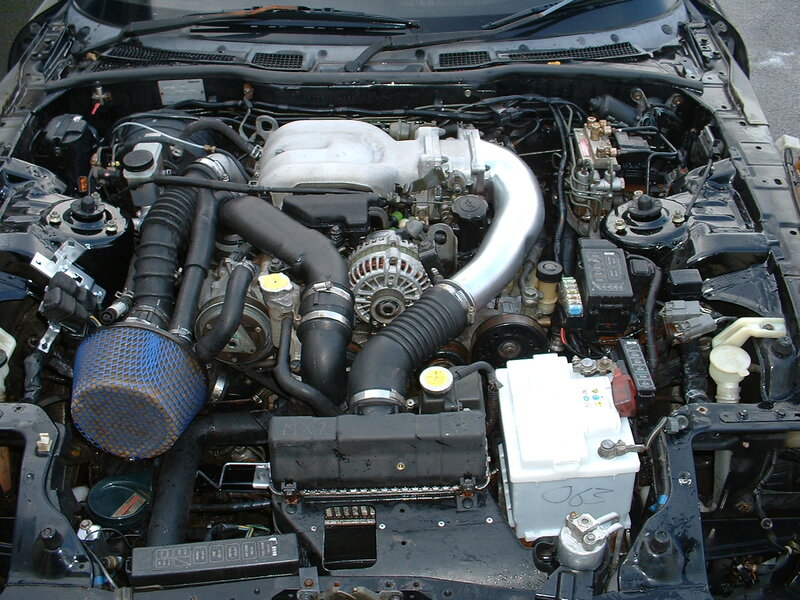 I had also found something else to lust after.. A Re Amemiya AD9 bonnet! 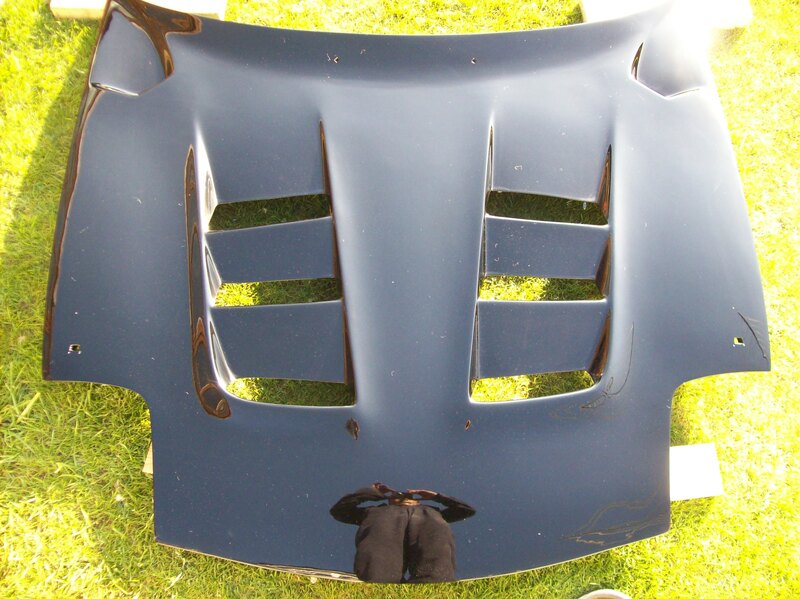 That or the scoot have to be the nicest looking bonnets out there for the RX7 and for me the AD9 just gets it. finding one of those cheap was going to be a mission! There was an increasing list of parts I needed to get to bring my vision to a reality! but I was getting there with hours of trawling eBay and various forums in the UK and abroad. This was all detracting from the fact I needed to fit the engine. A job I was not looking forward to with a maze of pipes I didn’t now where they went and a collection of wiring plugs that were much the same! There was no point on delaying the pain any longer! I set the car up on ramps to give enough height to get underneath to guide the gearbox down the tunnel if required. Getting the engine into the bay was pretty straight forward and problem free. And once I got into the pipes and wiring I managed to work my way through them one by one until it was all connected up. All in all it took me about a day to figure it all out. The next day I finished off connecting the last few bits of induction kit up and I was ready to push the button. I have to say I was very nervous at this point hoping I had connected everything correctly and tight! Well it was time to find out! First turn of the key and away she went! A little bit of smoke where it had been sat for a while and had oil poured in the ports to keep it safe from any moisture. After letting it warm up I checked around for leaks and gave it some revs and it was all perfect! Very pleasing! Now I was really spurred on as that was a major hump I was now over. 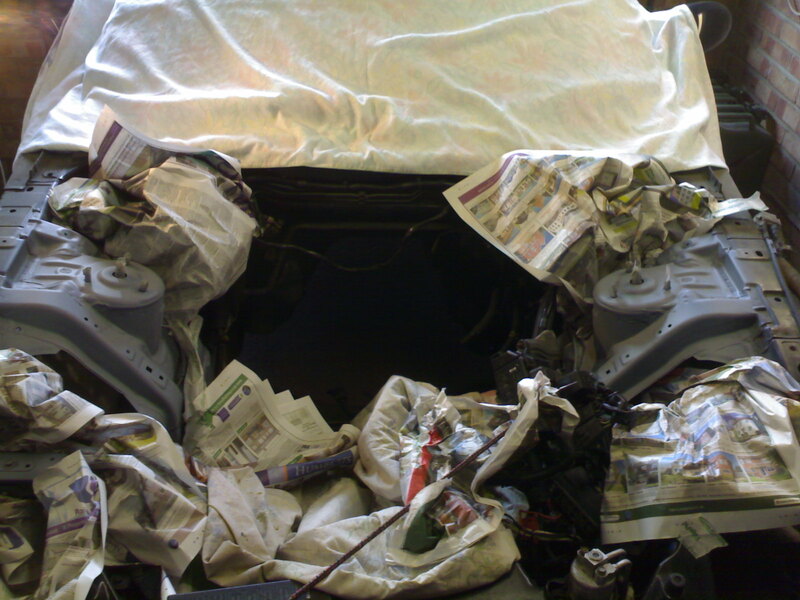 It was time to make a dent in the body work – excuse the pun! Really I needed to sort out some wheels so I had something to test fit the arches with and more than likely modify the standard rear arches to fit. 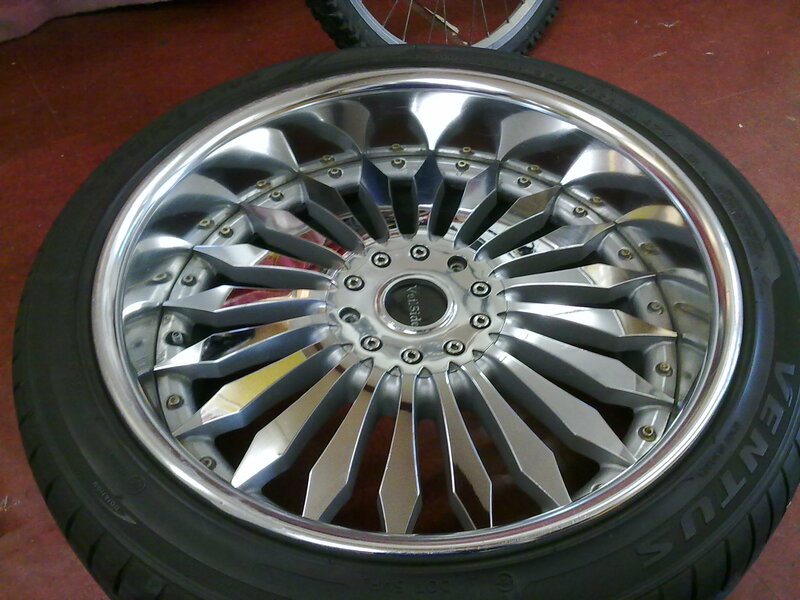 I had spotted a set of wheels on one of the forums that had been on for a while. I think they have to be described as a Marmite wheel (you either love them or you hate them!) That said I was sitting o the fence. I really couldn’t decide. I could see they definitely suited some cars and not others. They didn’t go anywhere after another week so I decided it was fate calling and took a gamble. The only way I was going to tell for sure was fit them to the car! 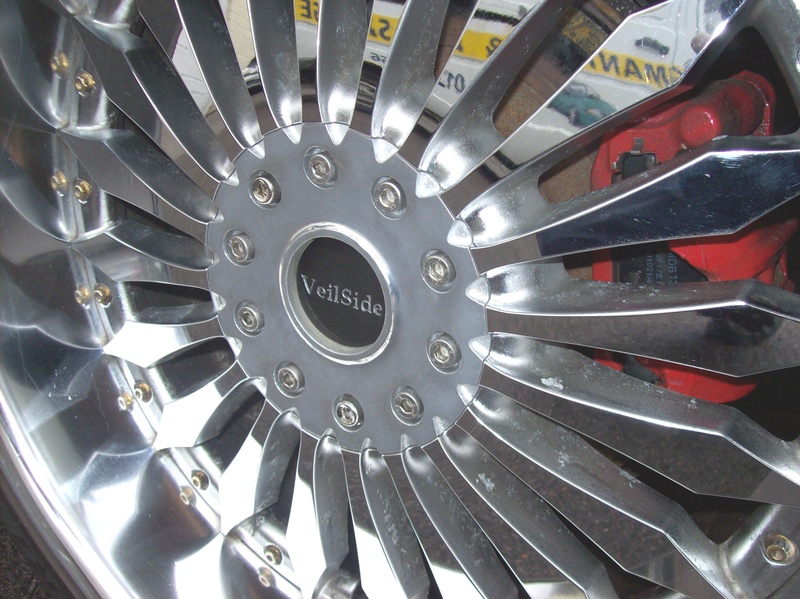 The rims were Veilside Andrew F’s. As well as being very rare, possibly the only set in the country but if not certainly only a handful about. 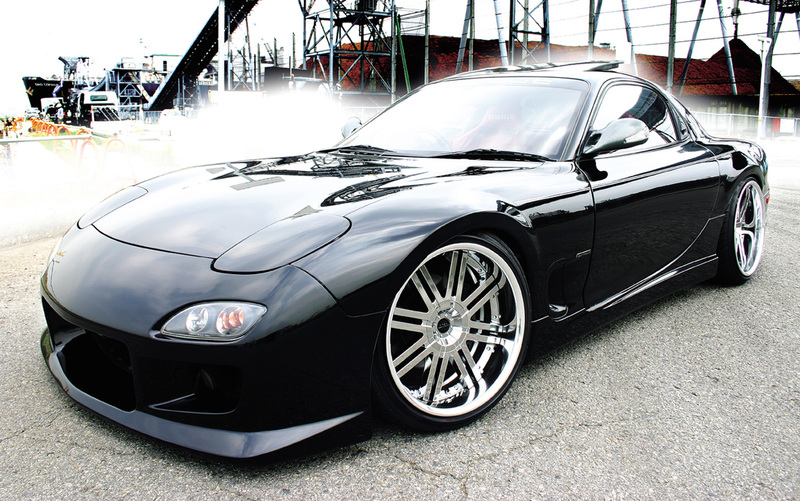 I also later found out that these were the rims used on the RX7 from the original Fast and Furious movie! I have to say I wasn’t particularly a fan of the films so I hadn’t noticed! 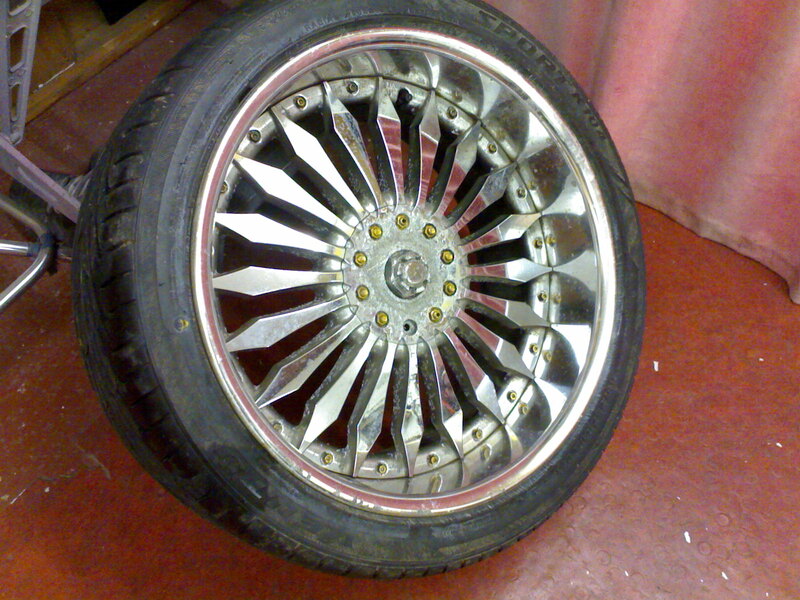 as you can see they arrived in generally good condition except the centre caps had seen better days! 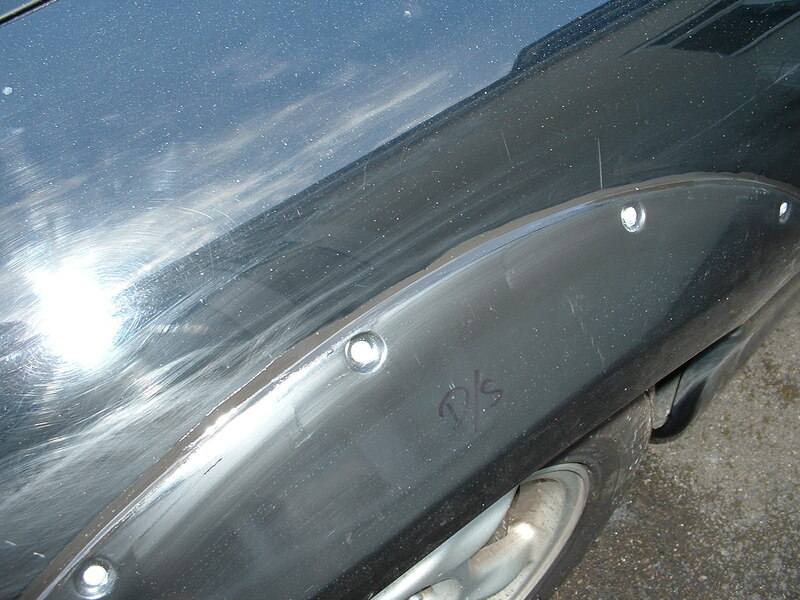 The chrome had flaked off and the aluminium below was corroding. I would see to that later. First thing was to offer them up to the car and see what I thought! Well I think I had found a winner! 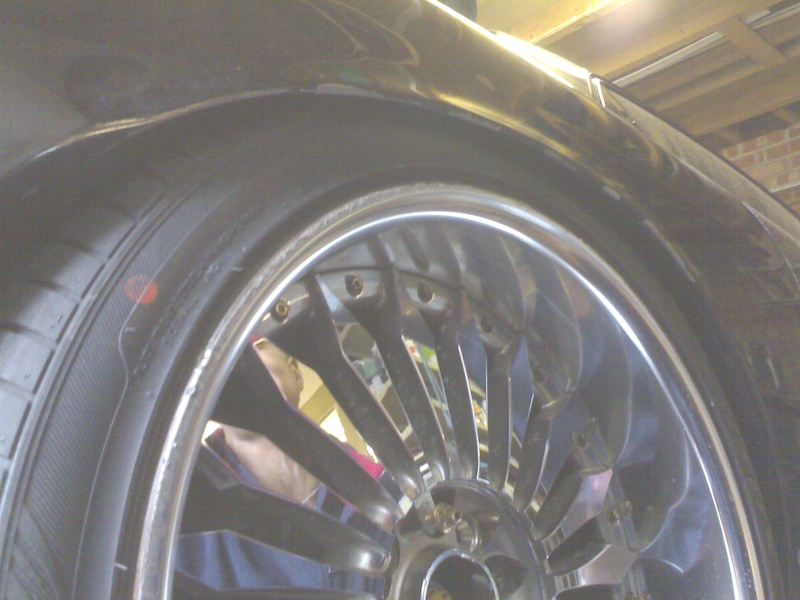 The wheels were wide especially at the rear and Stuck out from the standard arch. Clearly that was required to fill the burnout flares going on but it did however mean the bodywork was going to need so modification so the tyres did not rub when the suspension moved. After a bit of playing I figured I should be able to roll the standard arches out just enough to clear the tyres and avoid the need to cut them away. After an ask around on the forums I found someone with an arch roller I could borrow. Great bit of kit and made the job very easy indeed just gently teasing the arch out a bit at a time so as not to split the metal. Once I was satisfied I had rolled the arch enough I took out the rear shock and bolted the wheel up. Lifting the wheel up into the arch I could see there was plenty of clearance. Job done! I could now finally fit the flares to the bodywork. After a quick test fit and some minor trimming they were bonded and riveted into place ready for final blending. Blending the arches in was one of the most time consuming jobs to do. Filling has never been a strong point of mine so it was time to get as many tips as possible to do a good job. I was determined to get it right myself! First of all I went across the arch join with chop strand glass and used this to build up the worst of the step in the panel. Once this was off I cleaned off any loose fibres and then went over the panel with a standard U-POL Easy Sand body filler building it gradually up. Once I was happy I had enough build up I use shaped rubbing blocks and a DA palm sander to dress it back. I then filled any low areas again and repeated the process. 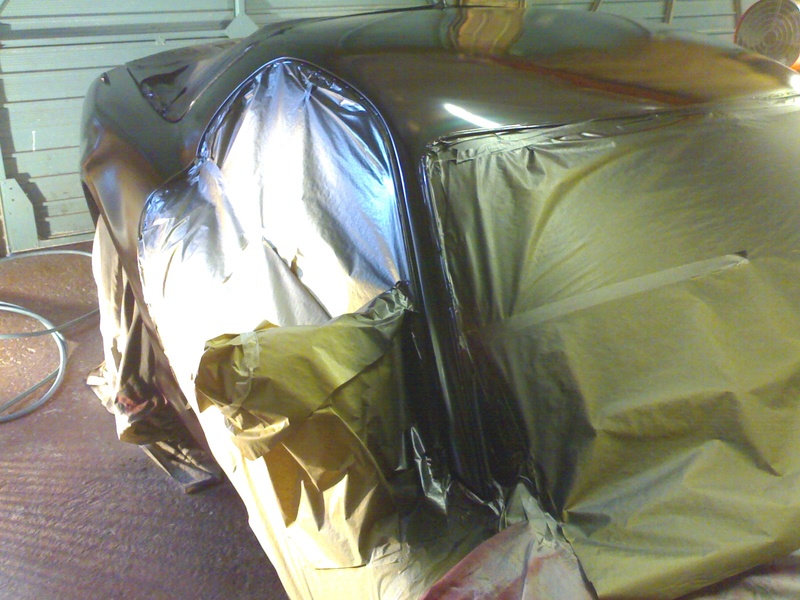 As I started to get close I moved over to a Top Stop Gold fine filler and prior to rubber down lightly sprayed over it with black so when I was rubbing down this would highlight any low spots that might need further filling. 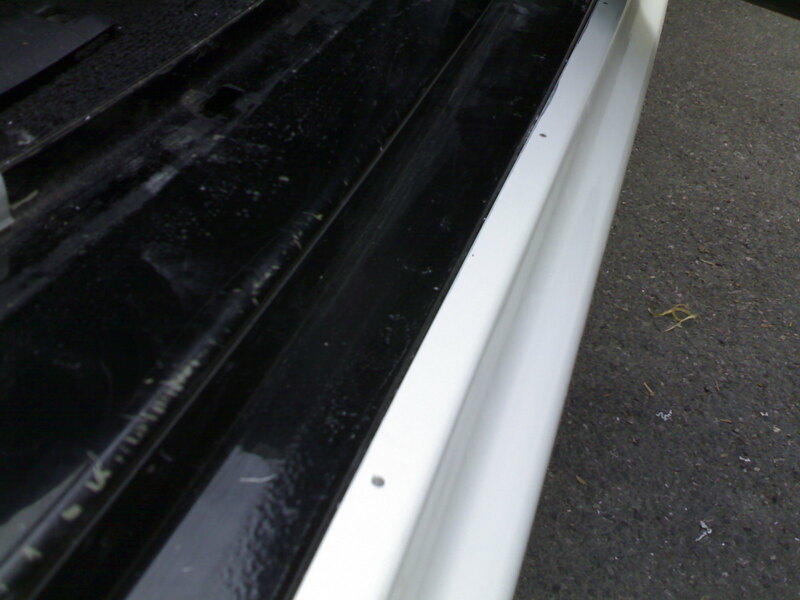 This is known guide coating. 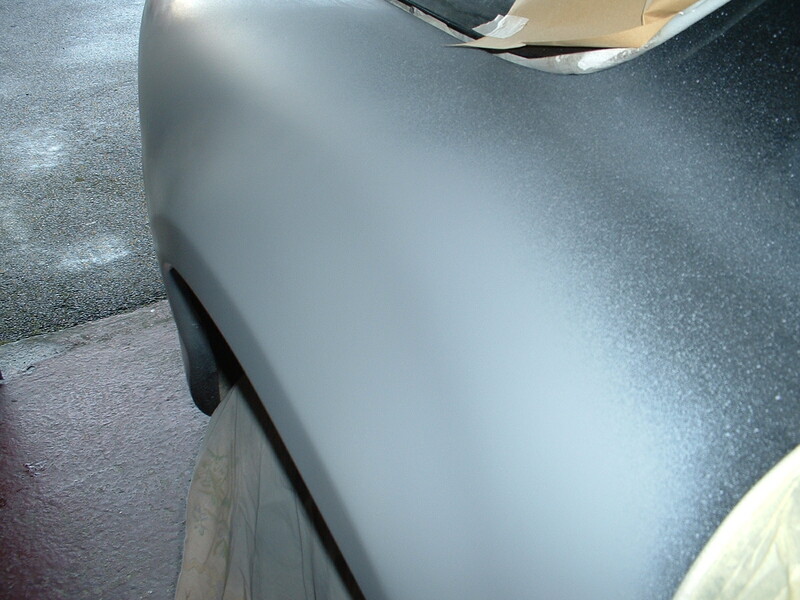 This process went on for a while until rubbing over the filler left no black paint. It was ready to paint at last! 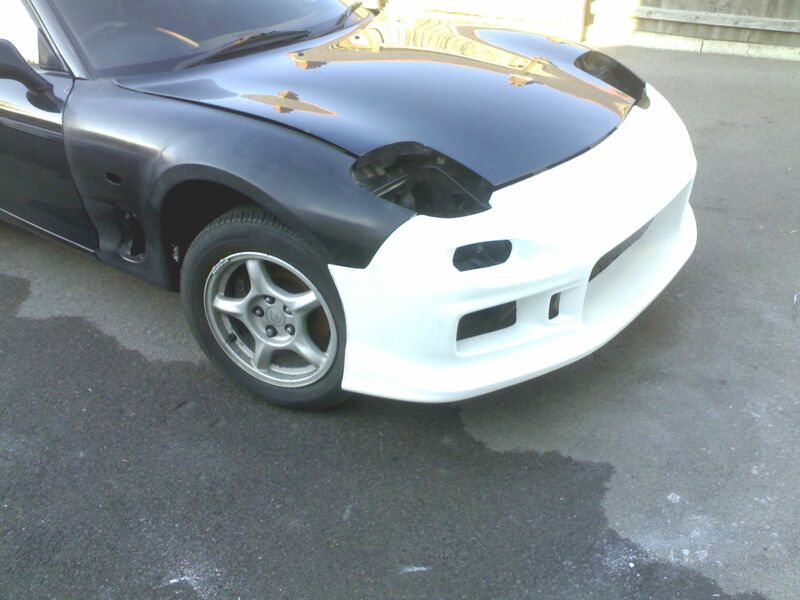 It was time to test fit the rest of the body kit so I could get all my paintwork done together. 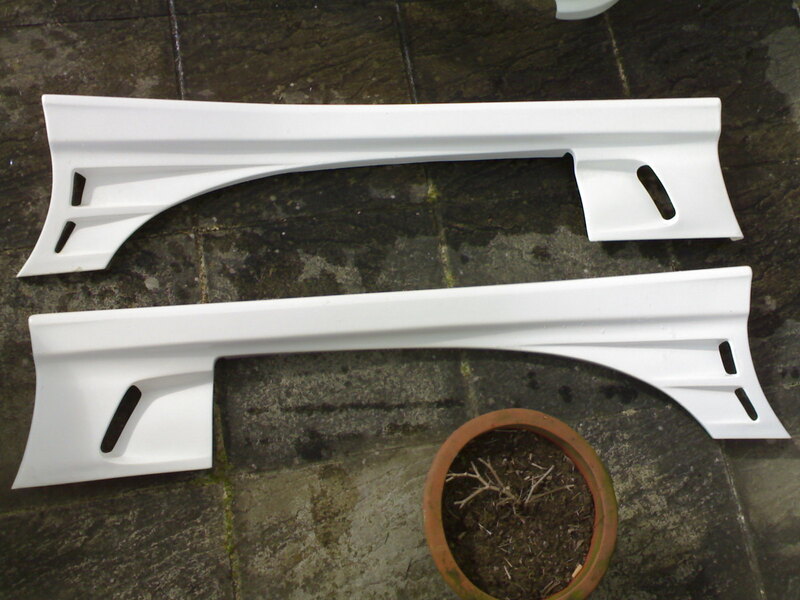 First up was the front arches and front bumper. 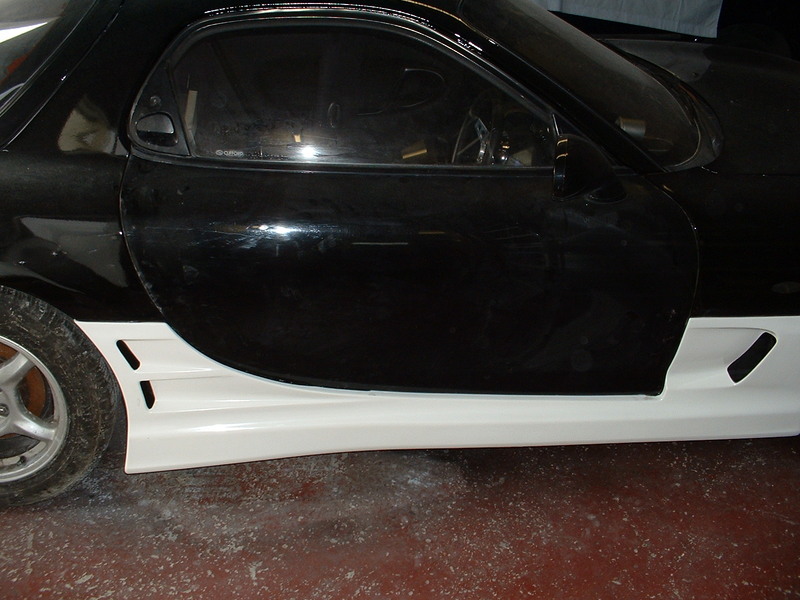 The arches bolted on with no problems but the bumper was a bit more tricky and needed some modification to get a good tight fit on all the seams. I finished off by fitting the standard bonnet to check all the shut lines even though I had plans for a different one in the end! It all looked pretty good. Next was to fit the side skirts and rear bumper. I decided I would make a little bracket to mount the side skirts on from some aluminium angle. This would ensure a solid, tight fit compared to some other methods I had seen. 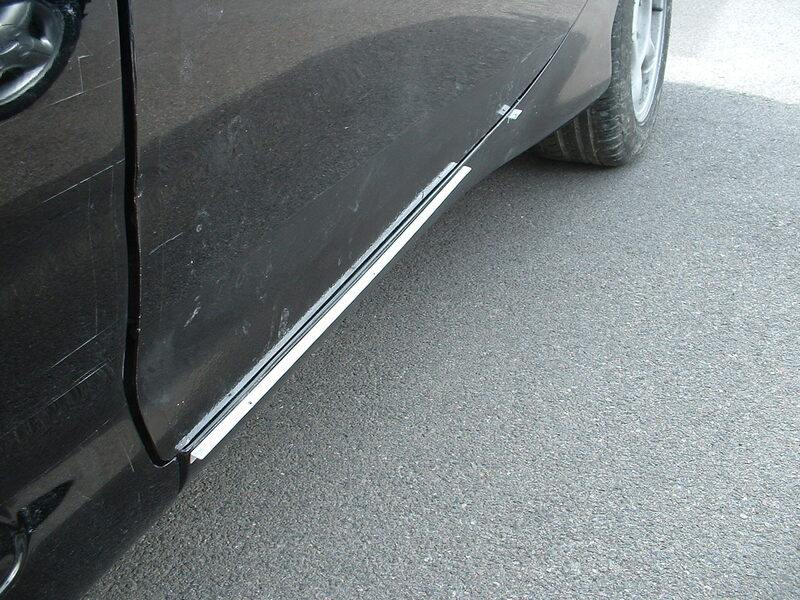 The sideskirts required minimal work to get the fitting nicely and one was slightly twisted but nothing that could not be rectified. 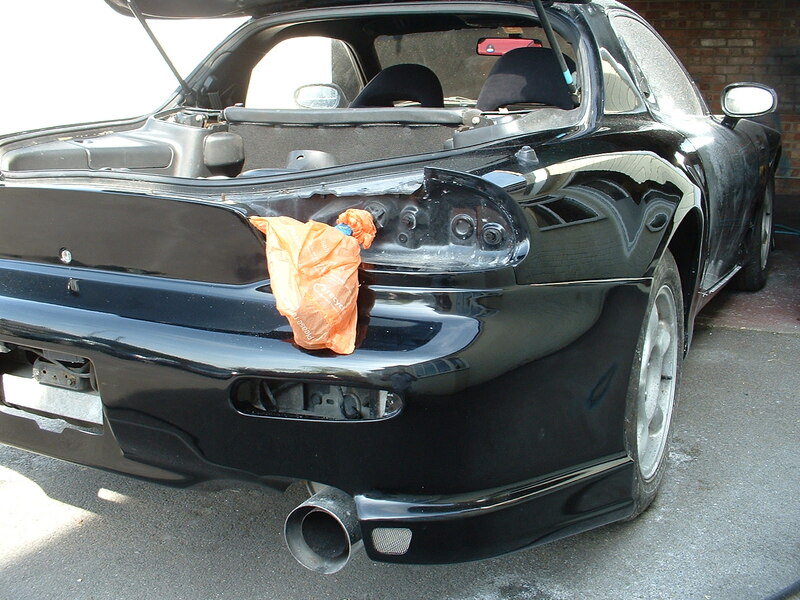 On the other hand the rear bumper was very distorted and did not fit that well at all. 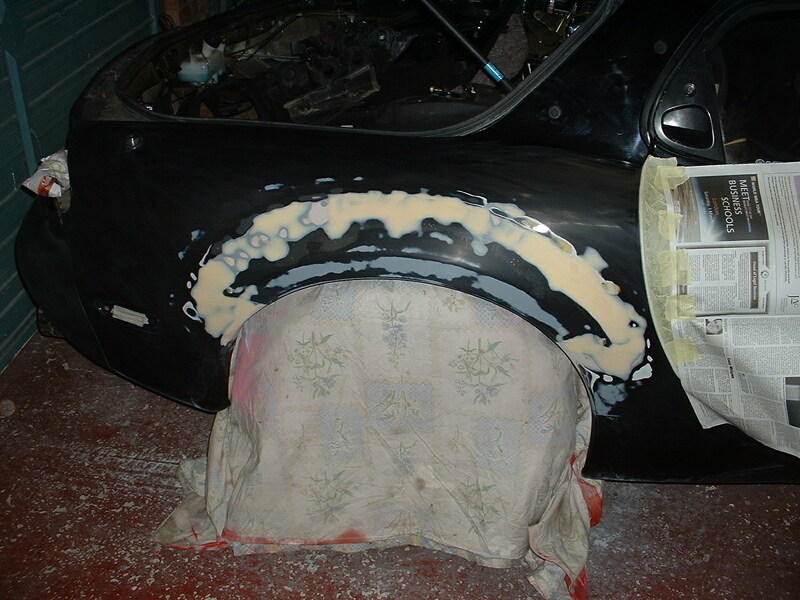 I overcame the problems by reshaping the bumper using heat and grinding away material from the inside to allow it to flex back into position and re-applying fibre glass once it was correct. 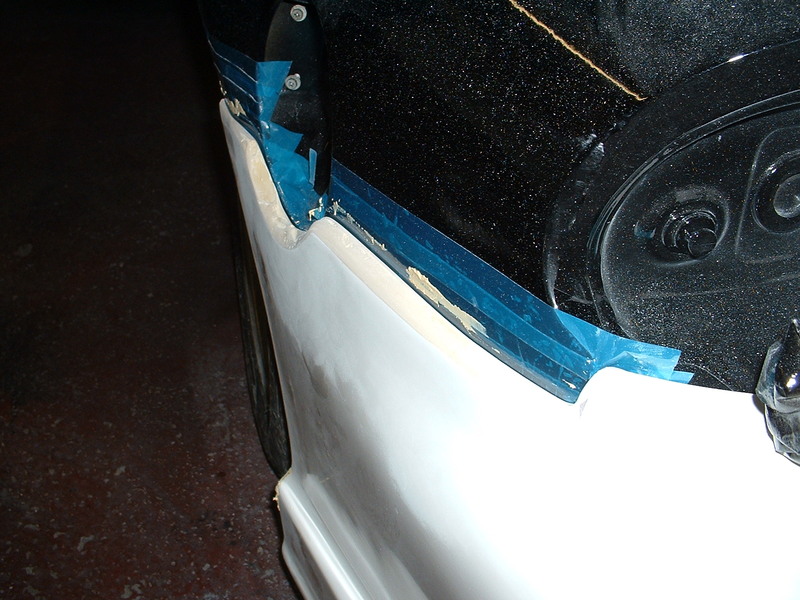 Also where there were gaps on the bodywork due to the wheel arch flares holding the bumper and sides skirts off slightly I taped the side of the car with a release tape and filled back onto the bodykit accordingly. 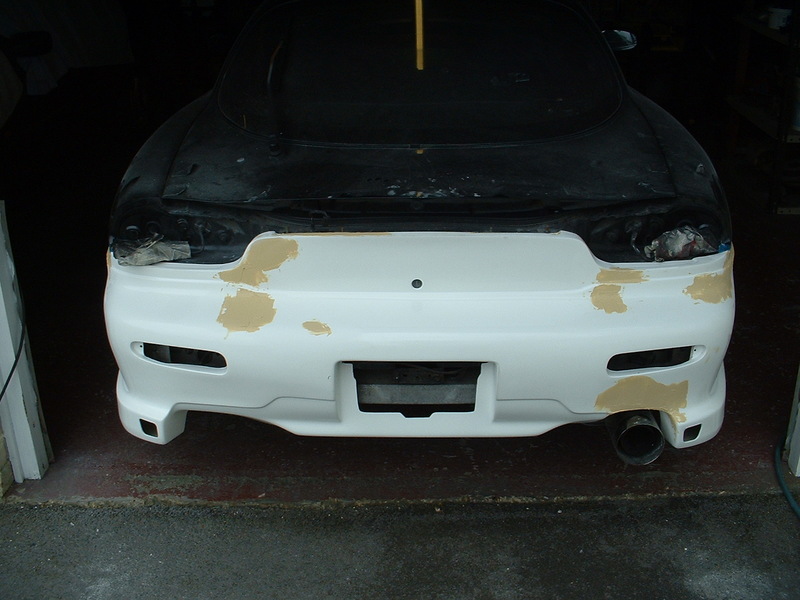 Now the whole bodykit had a seemless fit. 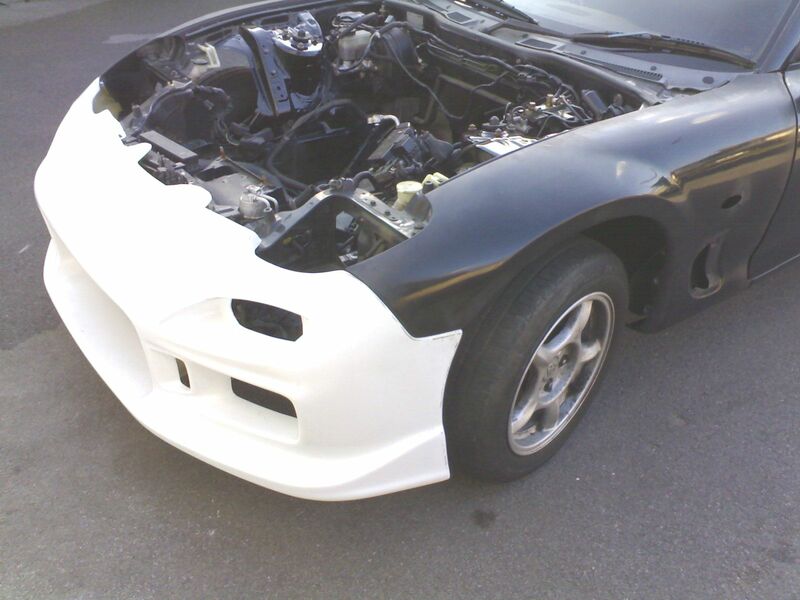 It was now time to get it all prepped and painted! 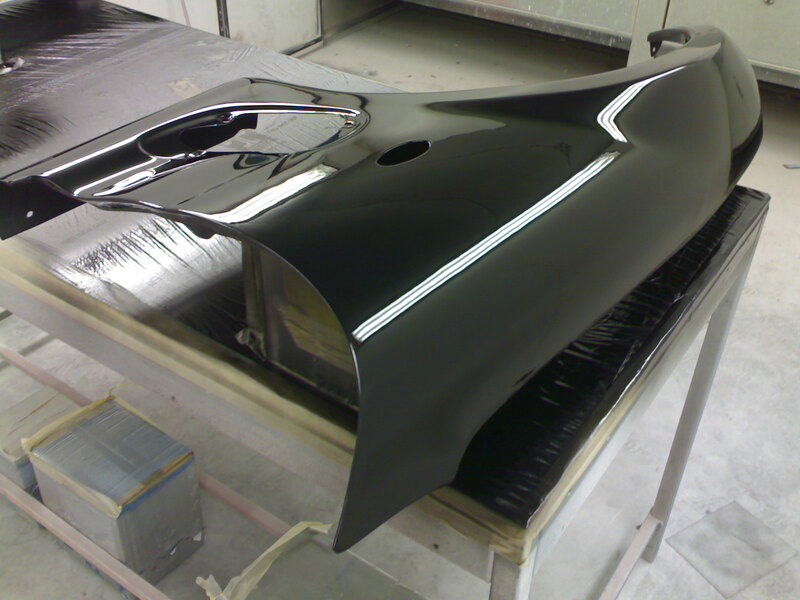 The plan was to blow the whole car over with a mazda black base coat and then cover this with a 2K clear lacquer to give best protection to the finish and hopefully a nice deep shine. 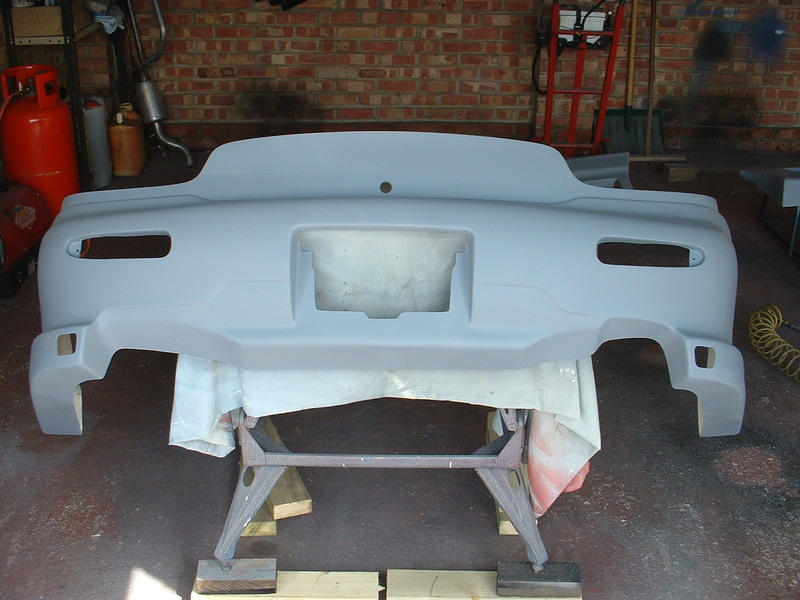 The bodykit and rear quarter of course needed a coat of primer first. 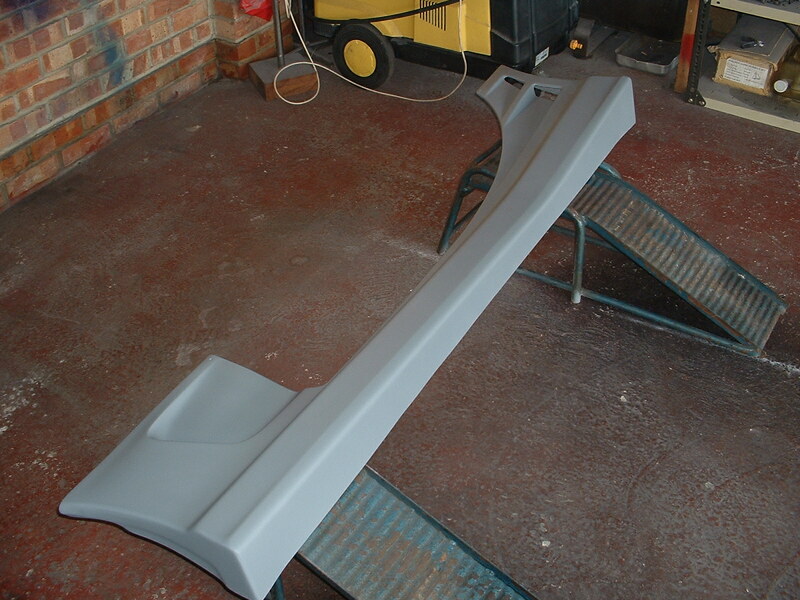 I had the use of a spray booth to do the separate parts so the front wings and bumper got painted using this. For the rest of the car I commandeered my dads garage for a few days! I thoroughly swept it out and hosed it out. I then suspended plastic sheeting across the roof and down the sides to be as sure as I could no dust or rubbish would drop into my paint! The process took a couple of days for the main body of the car and the same again for the bodykit as I did not have space to do it all at once and the 2K lacquer takes a while to dry without an oven. I found a good space heater helped no end though. The only part that I was happy with off the gun was the rear quarter. I had not got my gun set quite right and this came out quite orange peely. 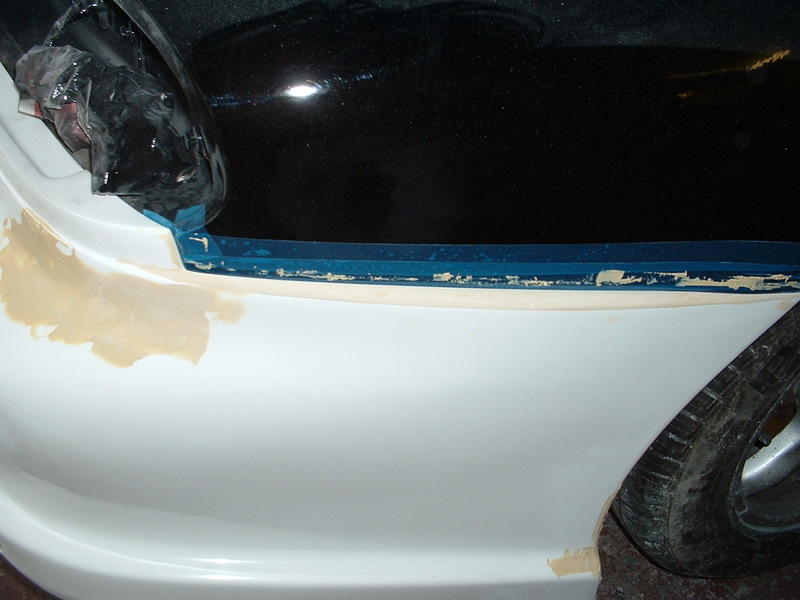 Not a big problem as there was plenty of paint to flat back to get it glassy. It just meant extra work! It was a new gun and I should have spent more time playing prior to painting but hey you live and learn! Generally speaking I was very pleased with my gun finish and it only needed a light flat and was ready for polish. 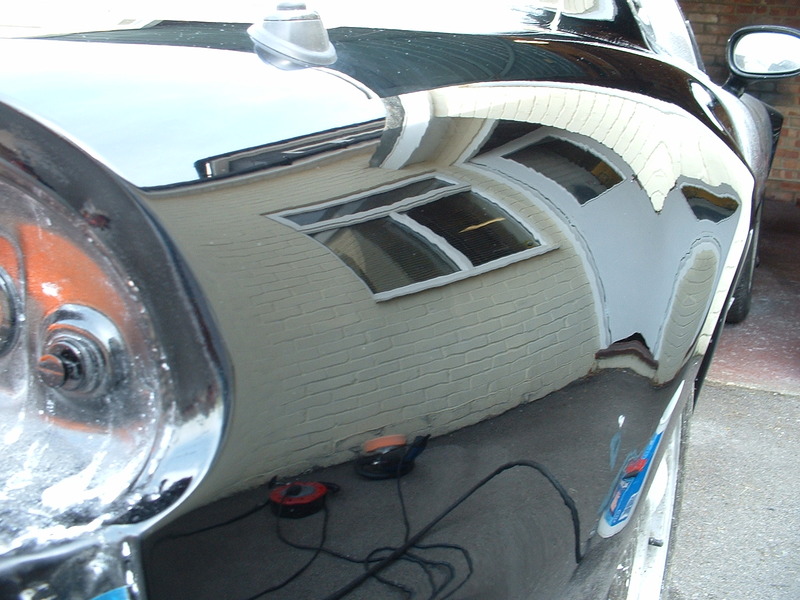 The wet flatting and polishing was a very messy part of the job but it sure pays off! I started with 600 grit wet ‘n’ dry for any bad bits. Where possible you want to use the finest grade possible to remove imperfections. I have since started using 800 instead Then you are down to 1000 grit, 1500 grit and finally 2000 grit wet n’ dry. From there you should be ready to hit it with a coarse compound using an electric polisher. 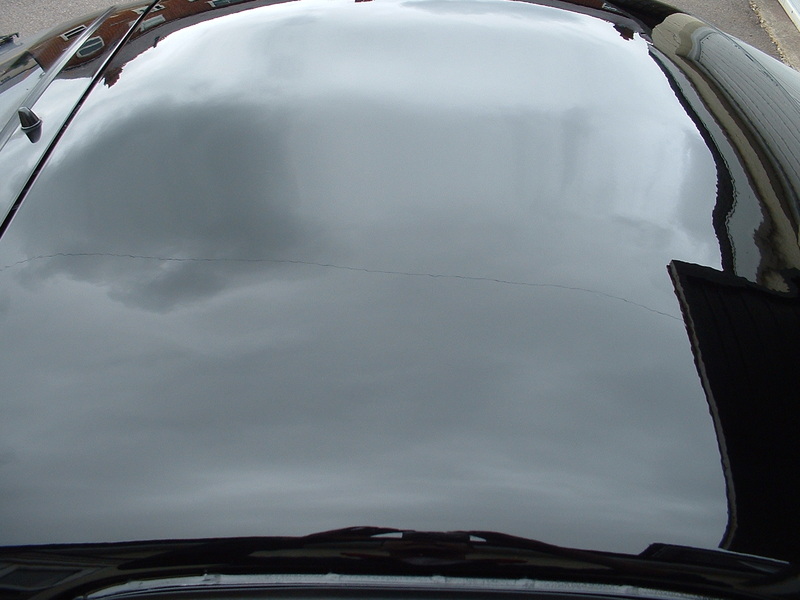 Same deal as with the wet ‘n’ dry you need to work down through the polishing compounds. Normally a coarse compound, fine compound and then a finishing wax of some description. I mainly use 3M products after trying various types I find these to be very good. 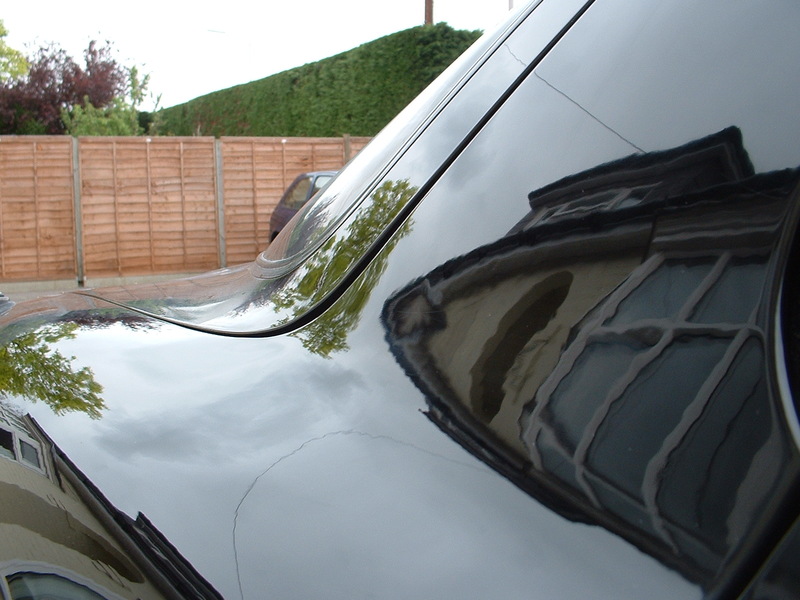 I also finish off with a carnauba wax to really give the shine depth. The results were very pleasing for my first full re-spray! 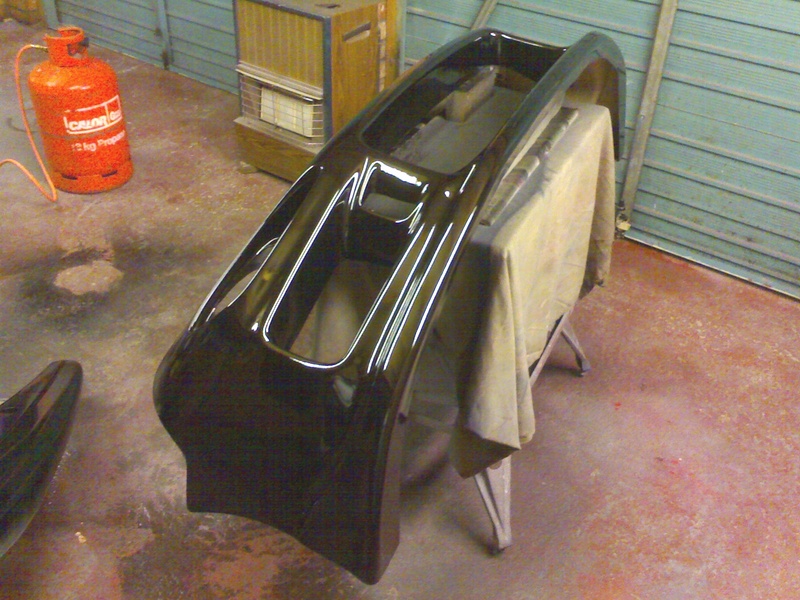 With the main bodywork all polished up I could get the kit polished and fitted up. The car was finally starting to take serious shape and it was really pleasing to see all my hard work starting to come to something! I was psyched to see it progress further so it didn’t take long to get the kit fitted up seeing as it had all be pre-fitted. 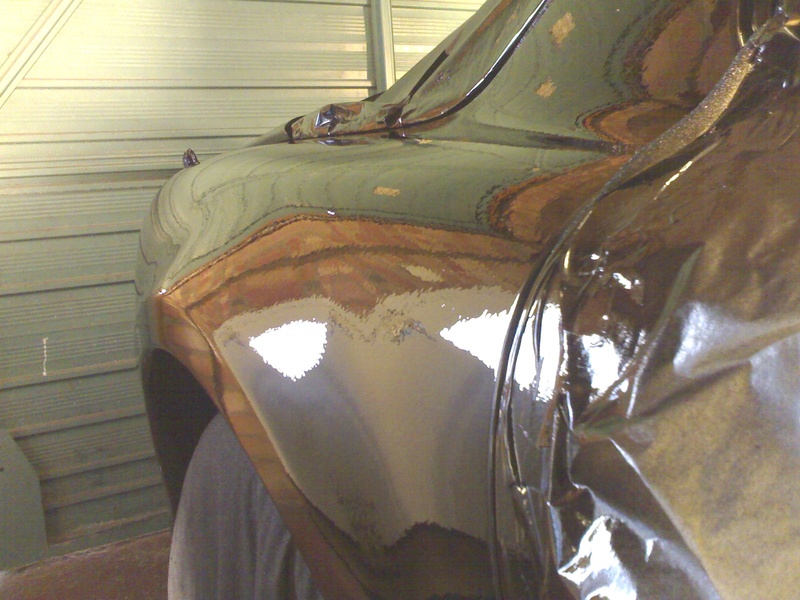 I finished up any polishing as I went add the final touches to the now pristine bodywork! To complete the rear I refitted the lights and trims. Now as well as the car crying out for its shiny Veilside wheels to complete it off it was also feeling a bit naked at the back end! I had been deliberating about what wing to go for for a while now. I just was not too sure I liked the wingless look of the KS Auto demo car. It looks okay at some angles then others it just looks like something is missing! After trying a Drift style wing and deciding that was definitely not in keeping with the look I was going for I thought about a C-west Hammer Shark wing but decided it was not going to follow the burnout kit lines. I then went a bit left field and took a flyer on a Re Amemiya Type Low wing. This is also quite a rare bit of kit and certainly not the first choice I would have come up with. But it looked like it might follow the lines of the kit and was different! Swings and roundabouts possibly but I was going with it! Worse case I could change it down the line! 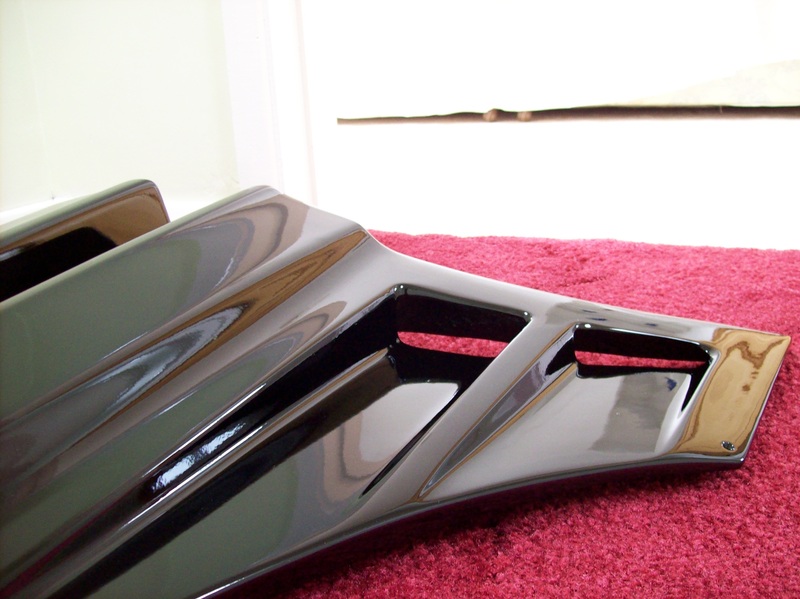 In the meantime I had been working on returning the Veilside Andrew F’s to their former glory! I had the centre caps stripped of the flaking chrome and got them polished up. 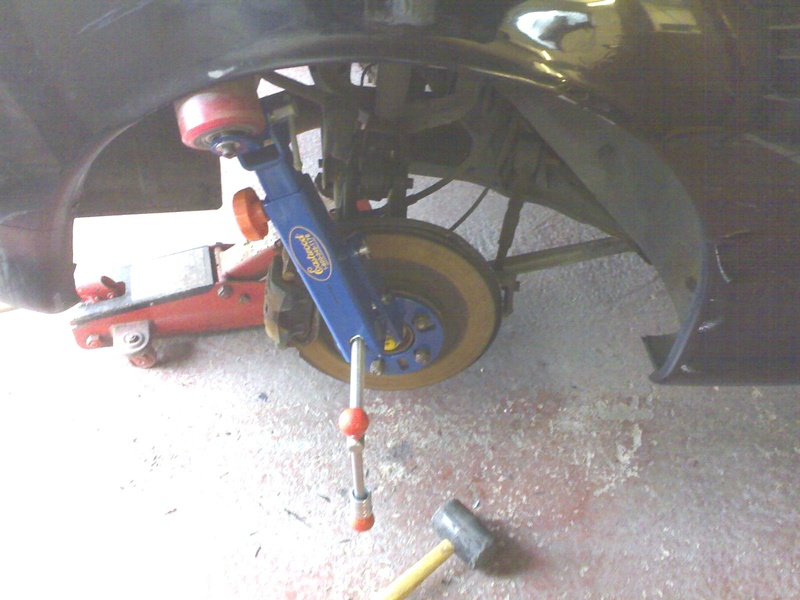 I also modified them to remove the unsightly centre nut and replaced the garish gold nuts with stainless cap heads. I then made a carbon fibre centre caps which I etched with ‘Veilside’ to finish them off. The rest was a bit of elbow grease to clean and polish them up. They say good things come to those who wait and after a lot of searching I had found an REA AD9 bonnet! It was a replica FRP version but then I wasn’t into the unpainted carbon look anyway. I test fitted and it was okay. Not perfect but a bit of tinkering here and there got it acceptable. 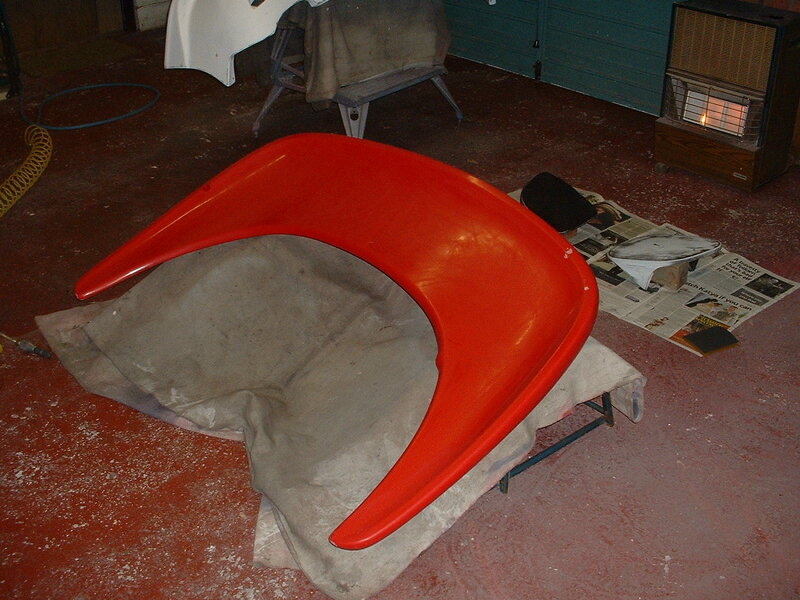 A quick coat of paint and it was ready to be fitted to the car and complete the look! It was now time to unveil the completed project.. Well part 1 anyway! 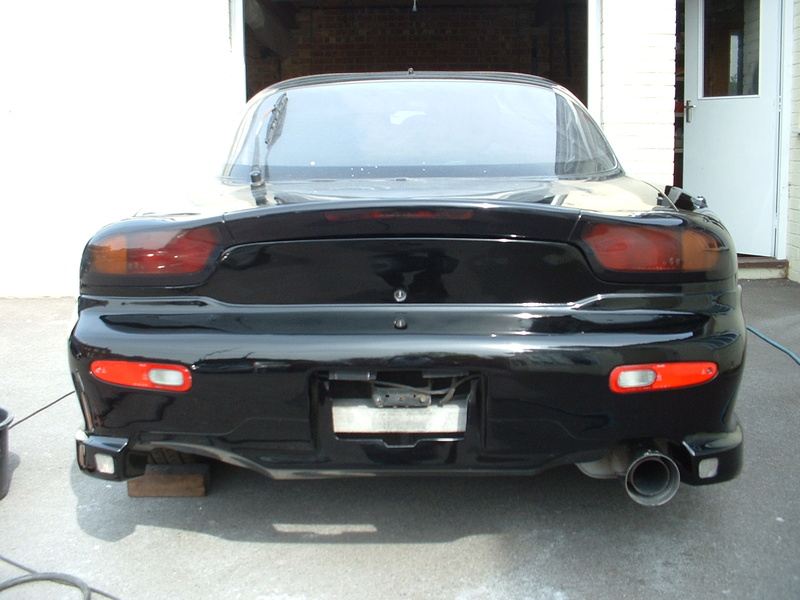 The car was currently running a Stock twin set-up with a CAT back exhaust system and Re Amemiya induction kit. 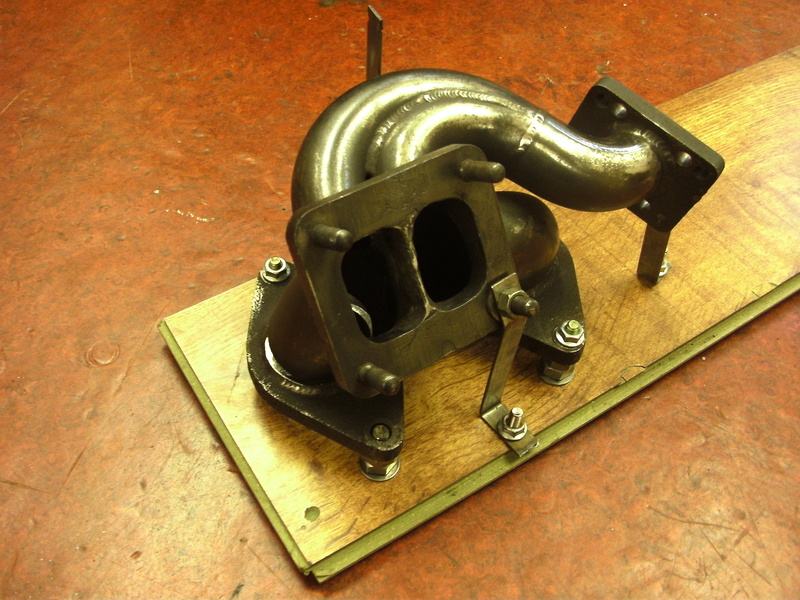 Of course, there was a plan for a single turbo conversion brewing! Single Turbo Conversion So the turbo conversion was to come slightly sooner than expected! 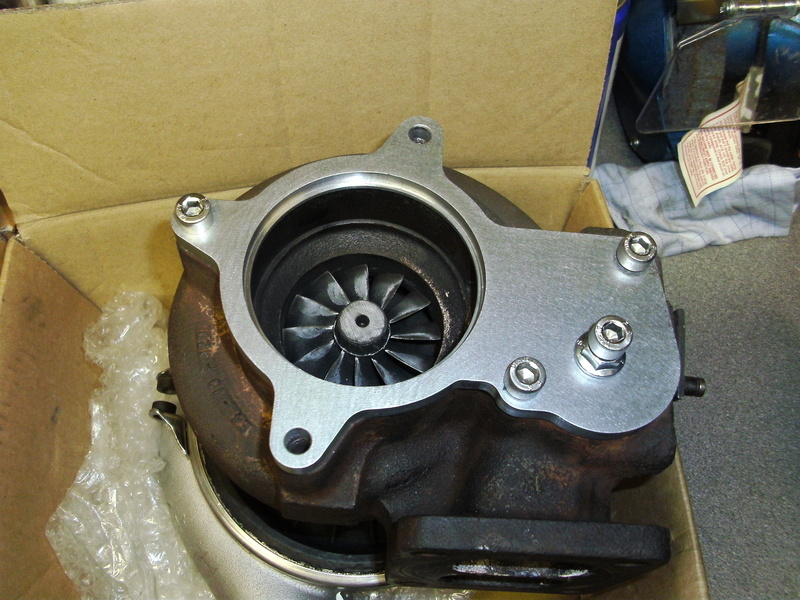 After about 6 months of relatively trouble-free driving I suddenly lost boost on the secondary turbo on my way back home from work one day. In fact I lost all boost but only when the secondary turbo was supposed to kick in. After hunting around all the pipework checking for leaks and changing some one way valves I finally decided the turbo must have died. Upon removal of the compressor inlet pipe that was confirmed. It was full of oil and had a lot of play in the shaft. 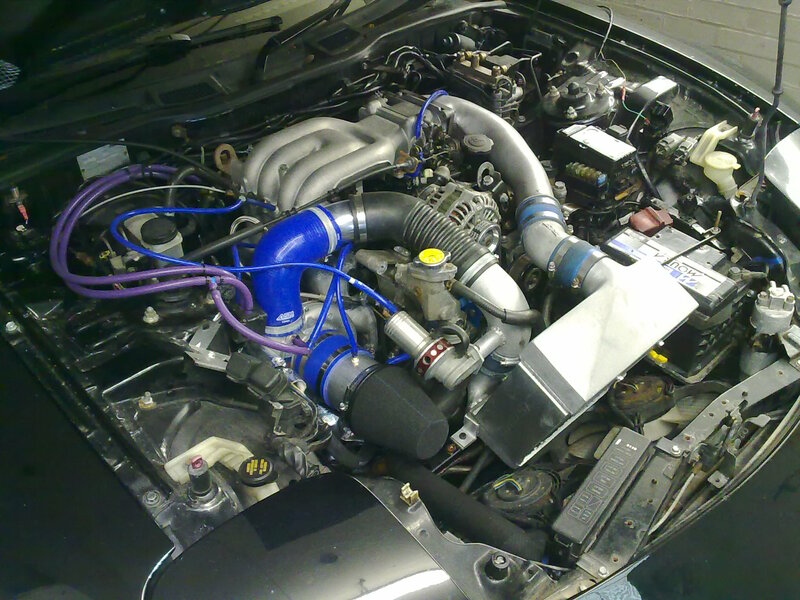 So the Mazda was once again off the road and the plan had to rapidly be put into action for the single turbo conversion. Fortunately I had started planning a bit already and had some idea of what I wanted to do.. It was more a case of getting hold of some parts! 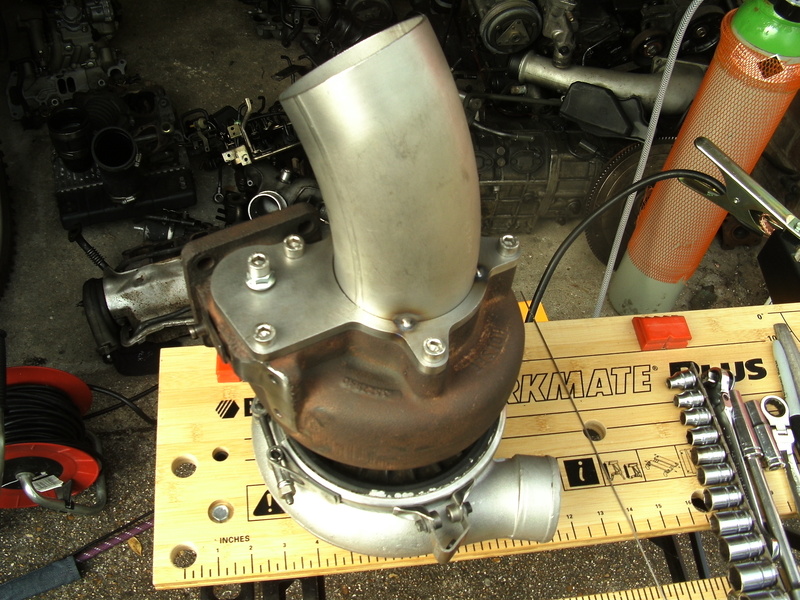 Reading around the forums there were a few options I could go with the single turbo conversion. As normal my aim was to produce a reasonable result on a budget! First thing was really to settle on what power goal I had. 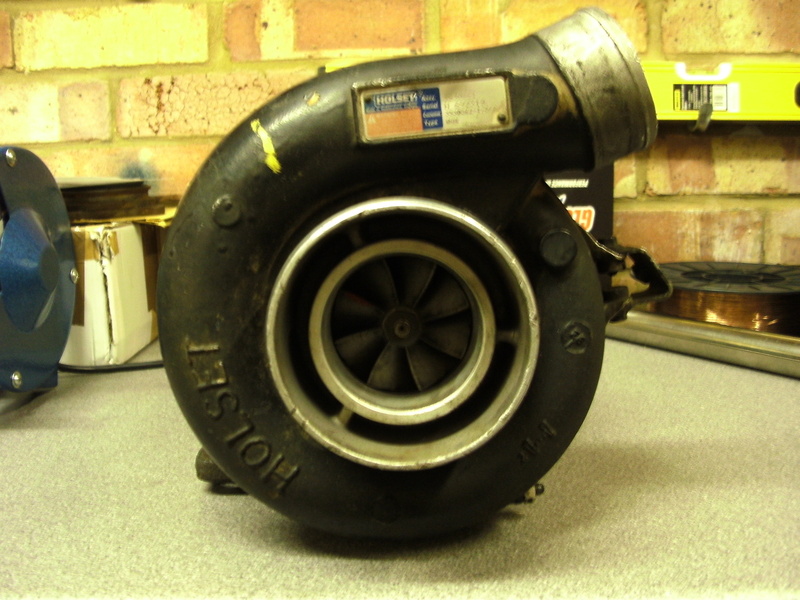 I decided a sensible goal would be around 420bhp at the flywheel. This meant I could get away with less modifications to the fuel system and also hopefully still have a driveable, reliable relatively economical car! 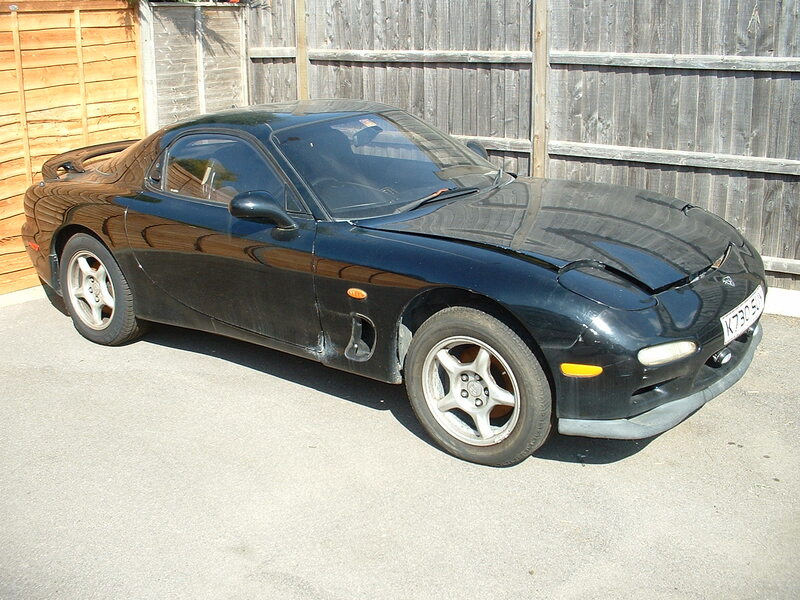 If Economical can ever be used in the same sentence as RX7! With that decision made it was going to be a lot easier to finalise what I needed to buy. Well a turbo and manifold would be a good start! I looked at various options on turbos. Looking at cheaper alternatives to the big names. the US have some good stuff and Masterpower units seemed to be getting a reasonable rating for sensible money.. But another option turned up that really took my fancy in my quest to try something a little different! Holset. 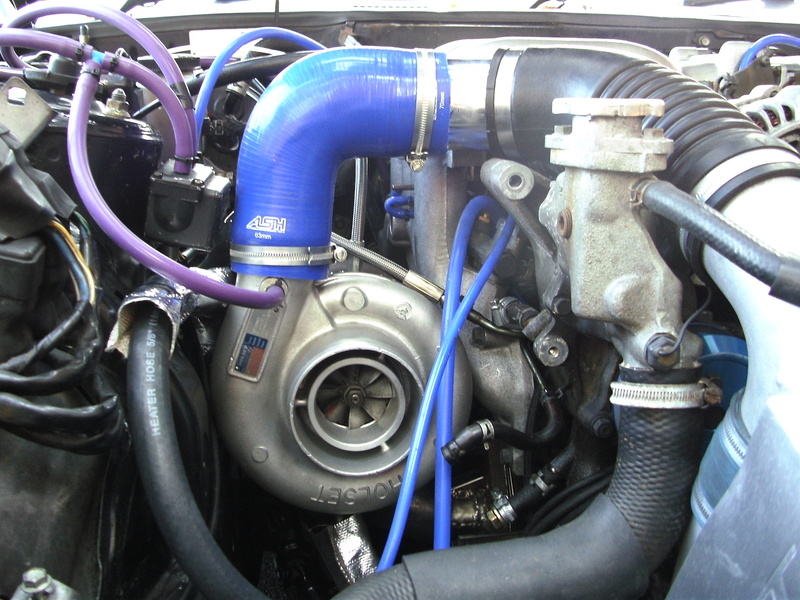 While looking on a US rotary forum I found that they had taken quite a liking to pulling turbo’s from big rigs and diesel pickups and putting them on their cars! I laughed but loved the idea!. So after much more reasearch trying to size a suitable unit I imported a unit from the states! There is not a lot for size comparison here but trust me when I say it’s pretty big! 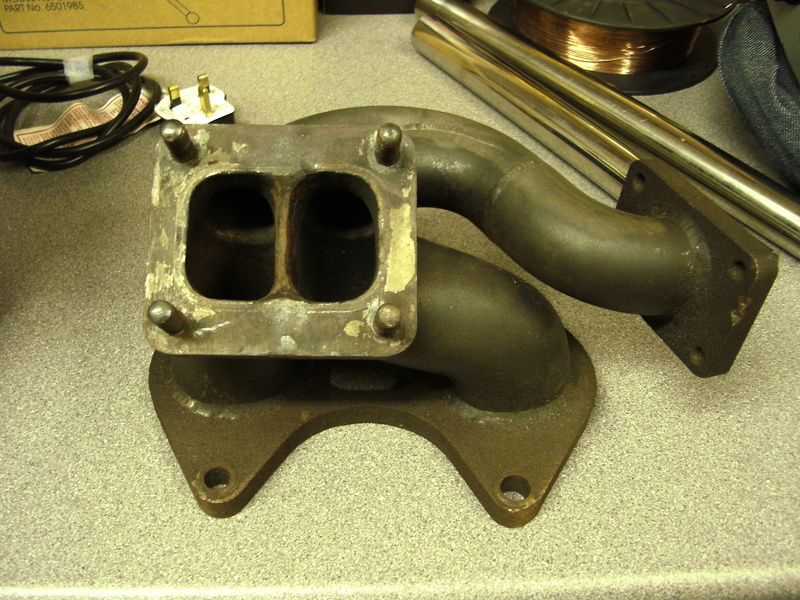 The compressor inlet is 4″ Diameter with a 2.5″ outlet. I picked a unit with a T4 divided exhaust flange so I could mate it to the majority of manifolds and the divided flange is supposed to be more efficient. Size did have a downside. I was going to be interesting packaging it! Time would tell that. First things first I needed to remove the standard twins and start throwing away other associated parts I would no longer need such as the dreaded Ratsnest under the inlet plenum. The engine looks tiny once you get it down to bare bones! There is a lot of stuff you can take out and blank off when going single. 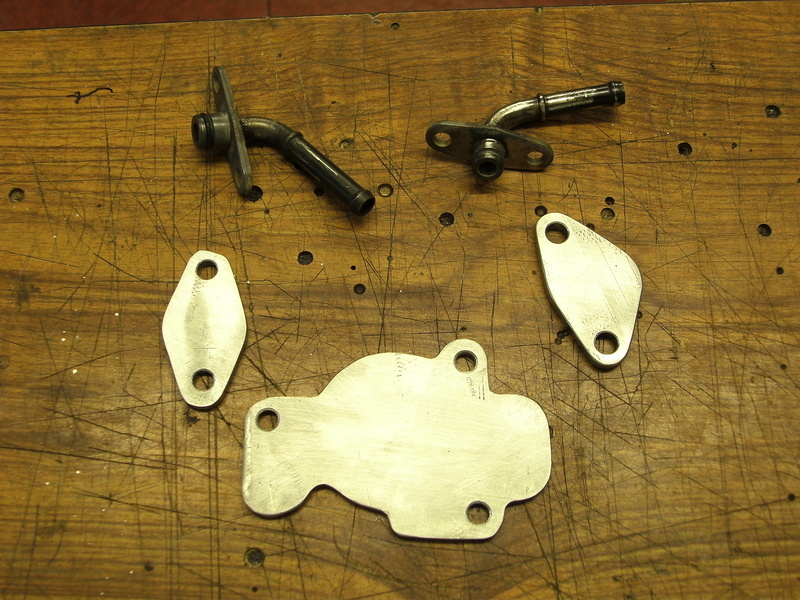 The airpump and associated control valve come off for a start so blanking plates for where it fitted are required. I made these up out of some 1/4″ aluminium plate. 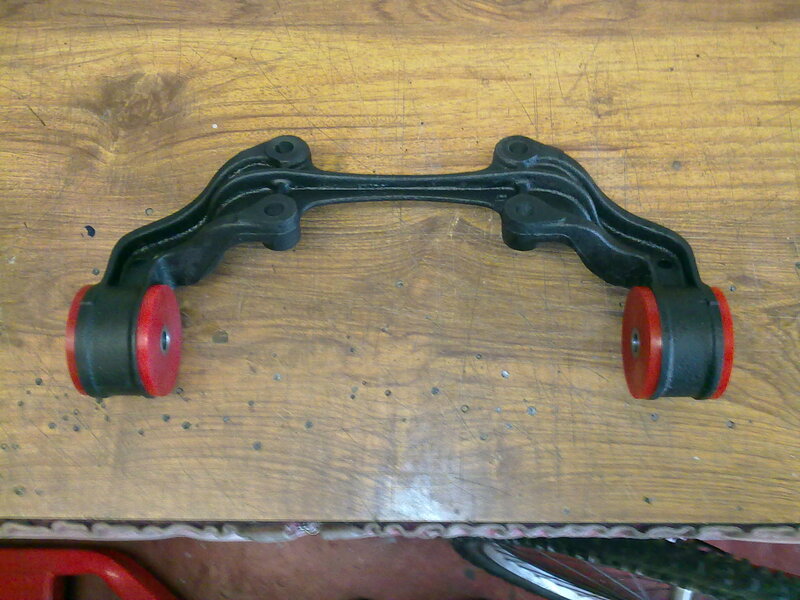 You also then require an underdrive pulley and belt set to compensate for the loss of the airpump pulley. 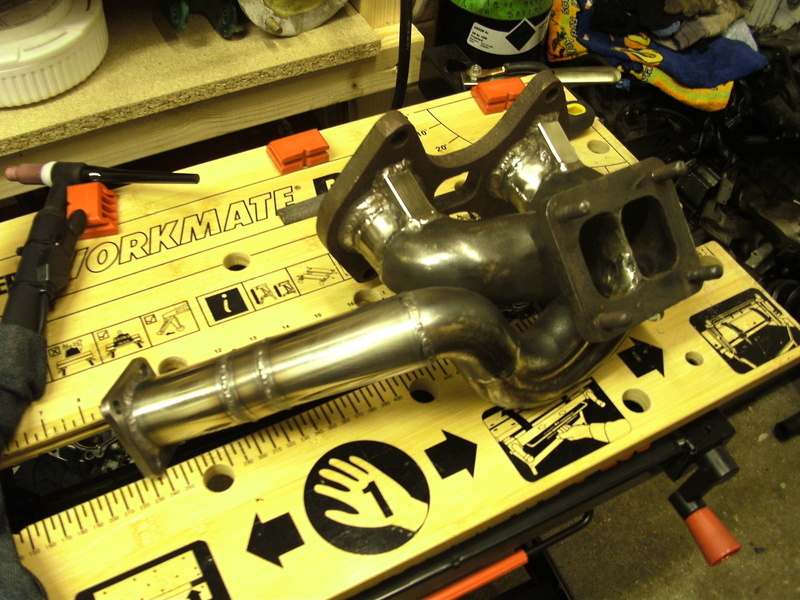 You can remove the double throttle system from the upper inlet manifold to gain a bit of air flow. 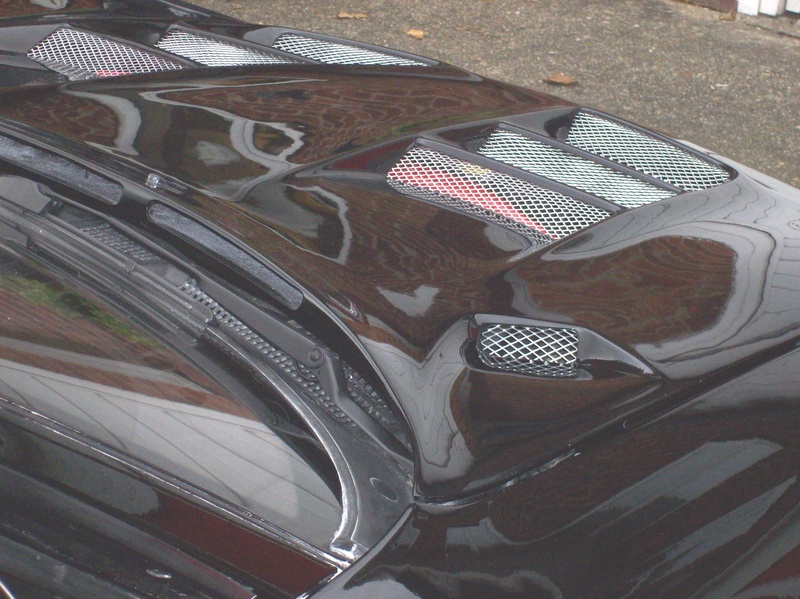 As standard this secondary butterfly set prevents you from revving the car too hard when it’s cold. Hence you need to drive with care once they are removed. Lastly for my particular setup and to keep costs down I was planning on using some 850cc Stock secondary injectors for primaries which require removal and slight modification to the Primary fuel rail. Of course to help fuel this little lot I was going to need an uprated fuel pump so out came the tiny little stock and with a little bit of modification to the pump carrier it was replaced with a 270lph pump. 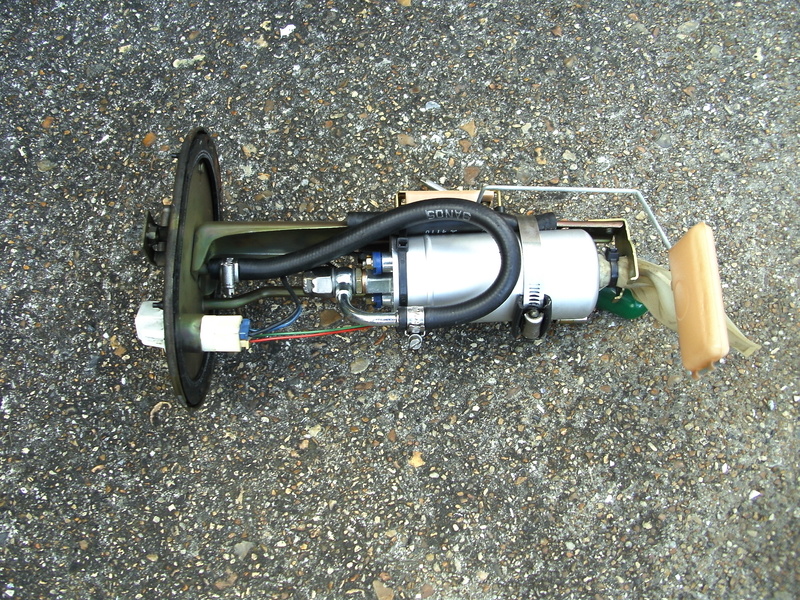 The larger fuel pump and power goals also in turn required an after market fuel Pressure regulator. As you can see the list seems to go on and on! Not to mention the little lines and fitting I had to make up to plumb it all back together again! All in all it took about 2-3 days to get the fuel and inlet side completed. 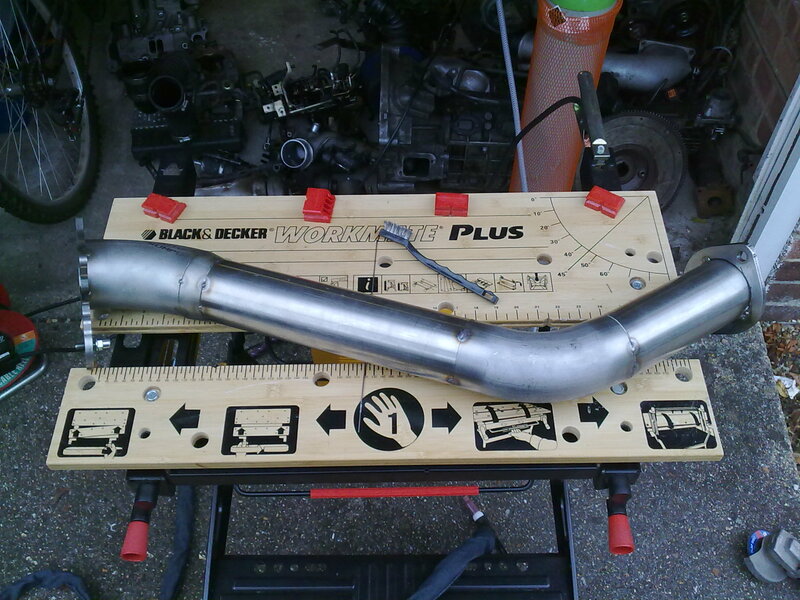 I had found a manifold on one of the forums to mount it to . It was a trust tubular manifold. 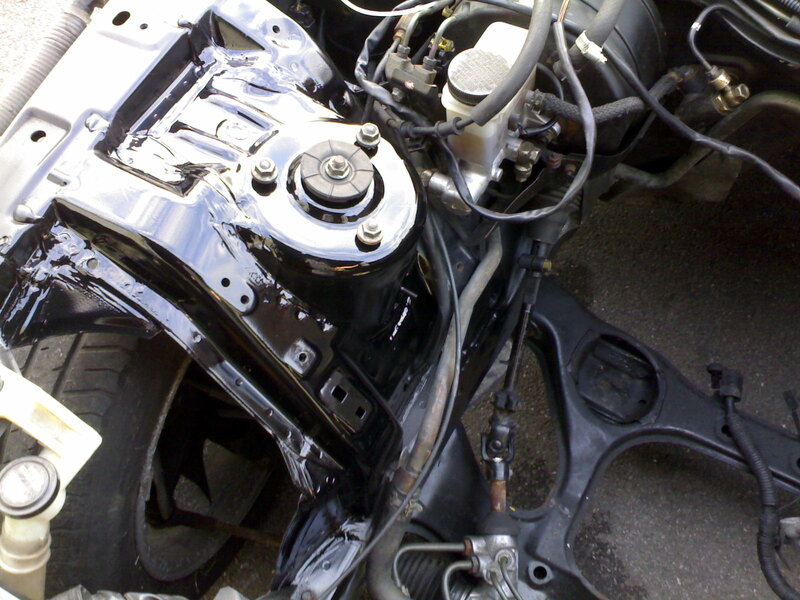 A quick test fit on a spare engine assembly I had in the garage showed that it was not going to work! 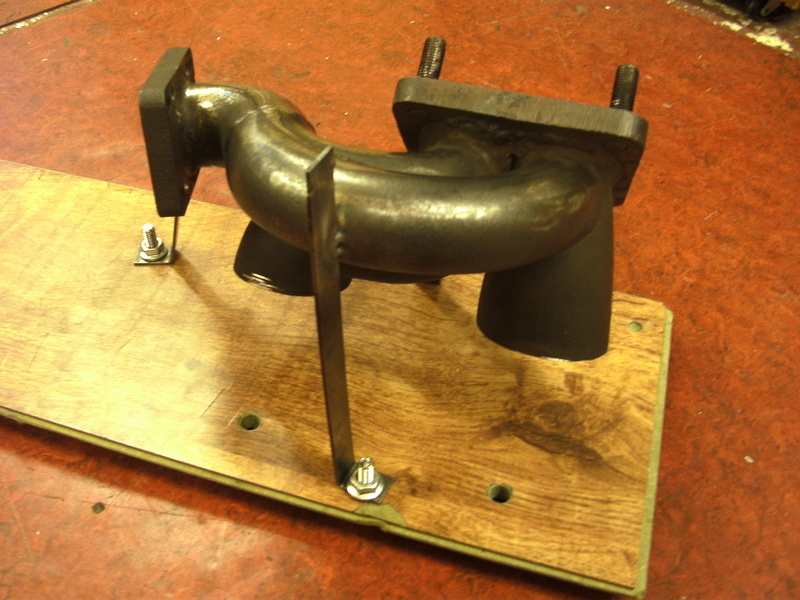 I tried another style of manifold to see if changing the position of the turbo would help but it was no good, There was only one thing for it. I would have to modify one of the manifolds myself! It was time to start learning how to TIG weld! Being stainless the Mig welder was just not going to cut it. 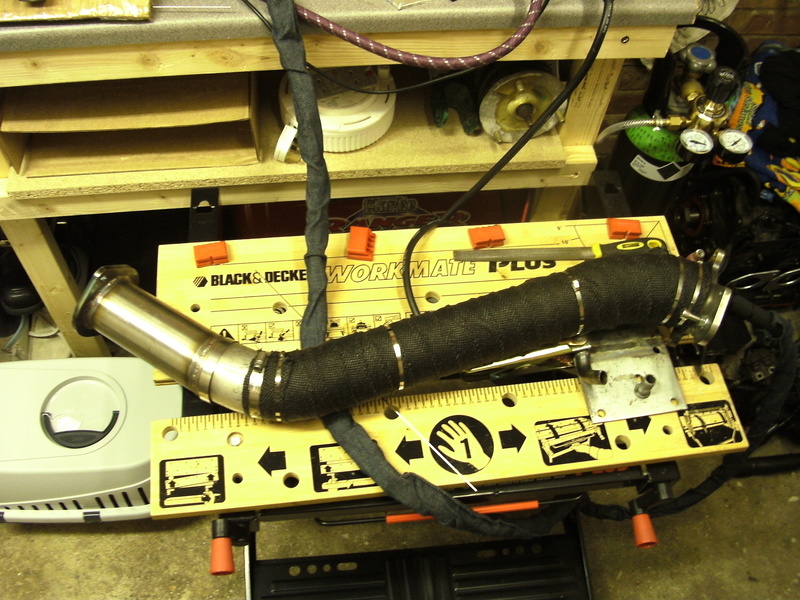 Besides which I had been wanting to get a TIG welder for a while so it was the perfect excuse. I was going to need one to make the down pipe later anyhow. 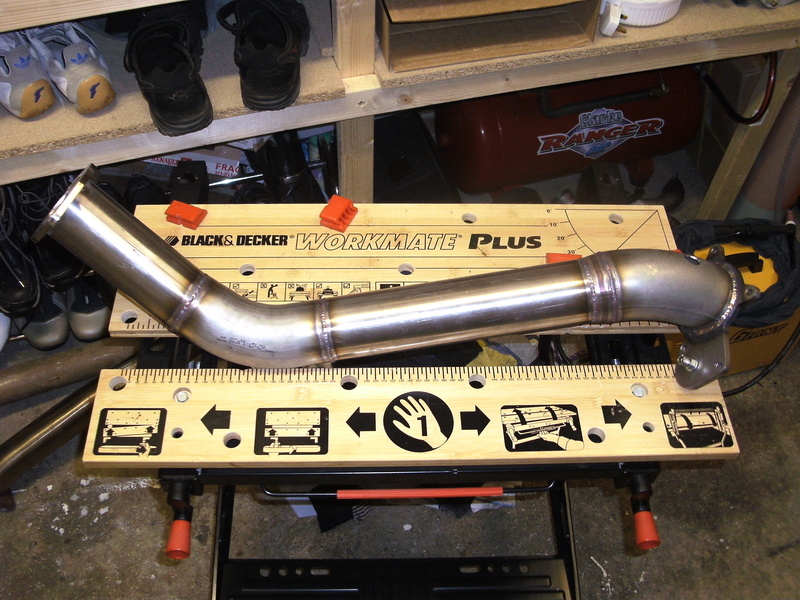 As the Trust manifold fitted closer I decided to modify that. So I took numerous measurements and made a simple jig to hold everything in line once it was cut and set to work. 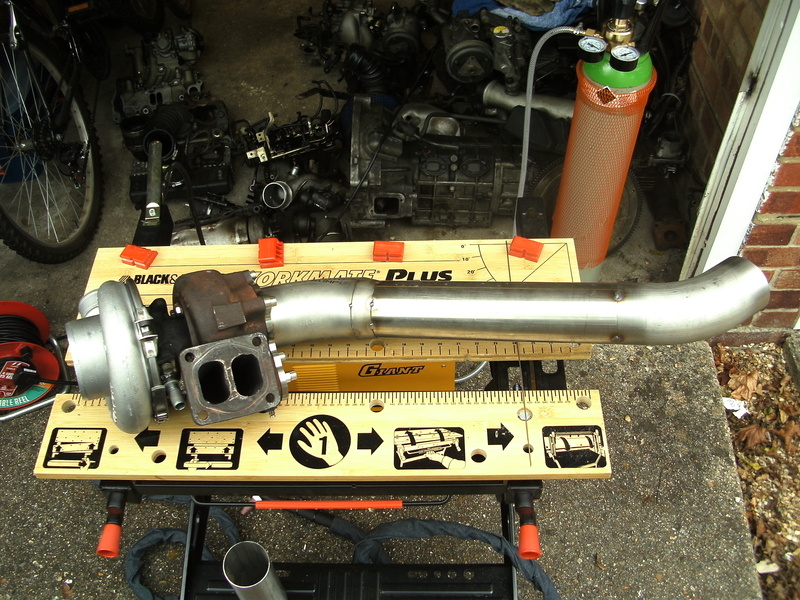 There were a few other little mods and parts to fabricate such as a heat sensor mounting position on the mid pipe and also a screamer pipe for the wastegate. Nothing to serious though. This meant everything was ready for fitting. The turbo went on straight forward enough. I found that I had to cut an re-route the water pipe to the heater system though. This was simple enough to do. 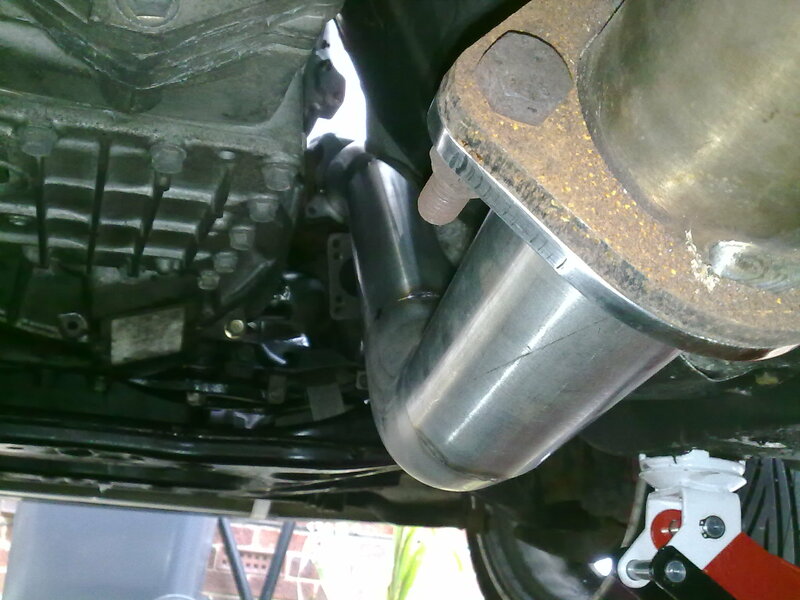 Fitting the downpipe was slightly more tricky mainly due to having to do it on a jack again and some of the fixings were quite awkward to reach with not much room for me to move! Once that was on it was pretty plain sailing. Last but not least I had to plum in my Trust intercooler and the induction side. I had to make a weld on stub to fit the Dump valve on the intercooler pipes which I had to get welded locally as it was on ally. Other than that I managed to utilise some of the stock pipe work coupled with a silicone bend and modified ally bend to complete the piping. The finished installation looked something like this! The pipe work has been refined a little since then and also the engine has a had a full rebuild due to water seal failure. Which was very gutting only a few hundred miles after completing the turbo install! But these things are sent to try us! I have also run some venting to the intercooler by modifying the factory air feed slightly. 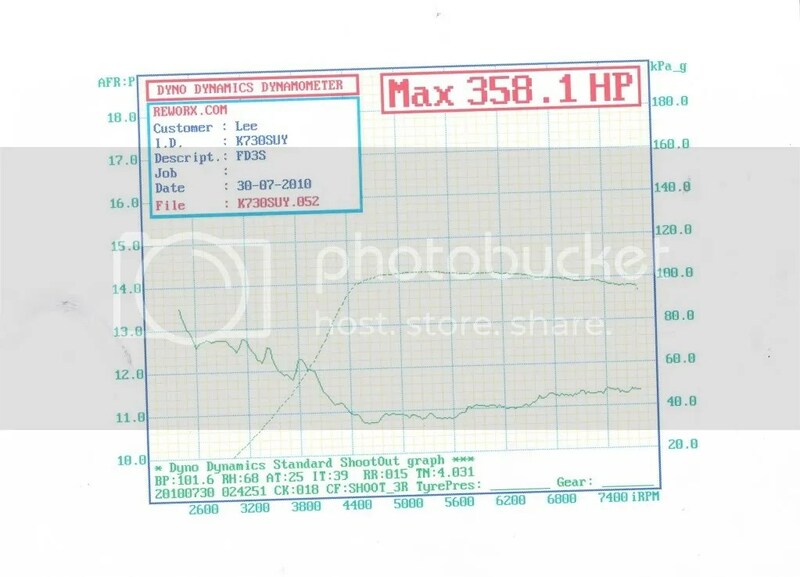 In it’s current state the car is runing 305bhp at the wheels at only 0.8bar! So fairly pleased with that. 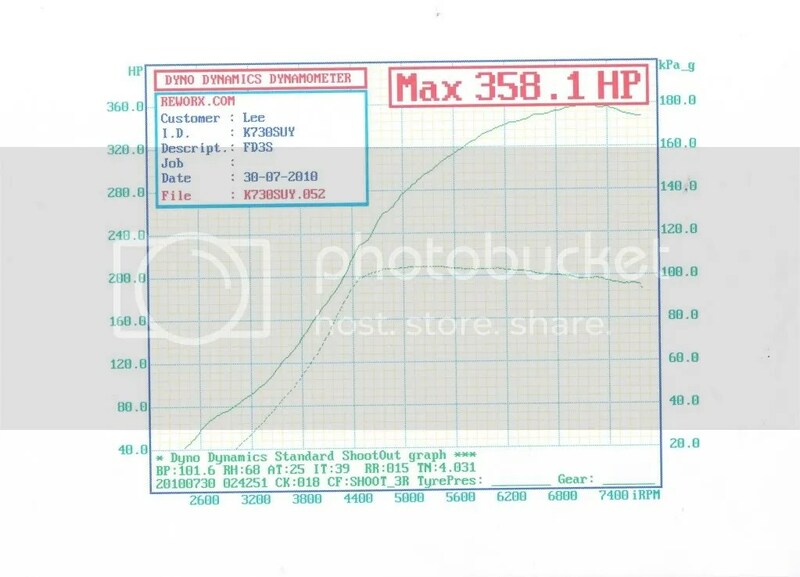 That puts me under 400bhp gross and I was aiming for a little over that. Plan is to add some boost shortly and see what we can get aroud 1.0 bar. I’ll update when that happens. Other mods I have made to the car since the conversion are some custom uprated PU diff mounting bushes and PU engine mounts. With these the car has become a much more solid and controlled drive. Being harder than stock mounts they do transfer slightly more vibration but not uncomfortable. 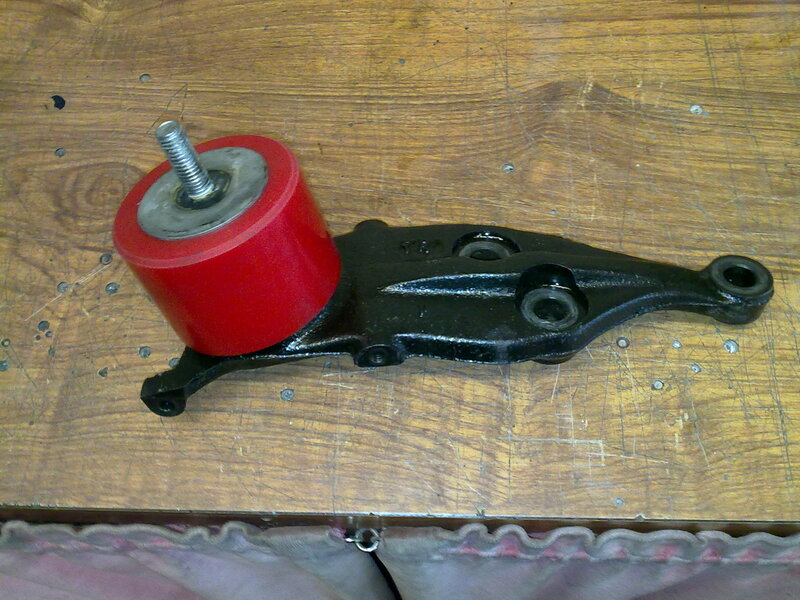 I am working on a revised design for the engine mounts to try and reduce that slightly. I finally got around to sorting out a boost controller and winding the boost up to 1.0 bar to see if I could top 400bhp (flywheel). I had problems with my electronic boost controller so decided to make my own mechanical one based on a dawes device but using a little bit more finesse than the ones you can get off ebay that don’t seal properly and most people complain boost spike. So I set the unit up and fitted it to my car ready for tuning at Reworx. After putting a new pair of Leading plugs in (Done a set in 1000miles!) due to ingnition breaking up I must say the results were very pleasing. I think the graphs say it all. 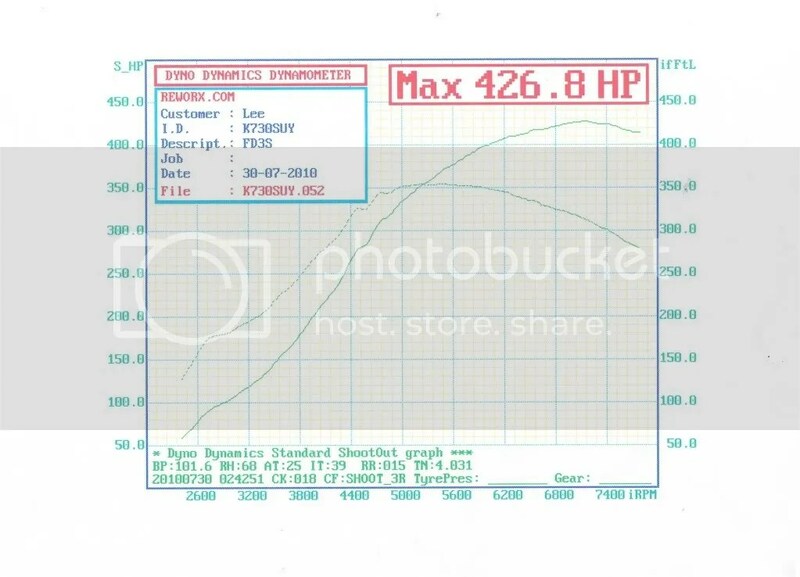 Wheel power and Boost Boost and AFR Estimated Flywheel power and Torque Must say I was stoked with the results.. My aim was to top 400bhp on a budget so over 420bhp is very pleasing indeed. The hard graph paid off! As you can see the boost curve is very nice and smooth. I have not road tested the device much yet but I will see if the performance lasts and may offer them for sale in the near future. 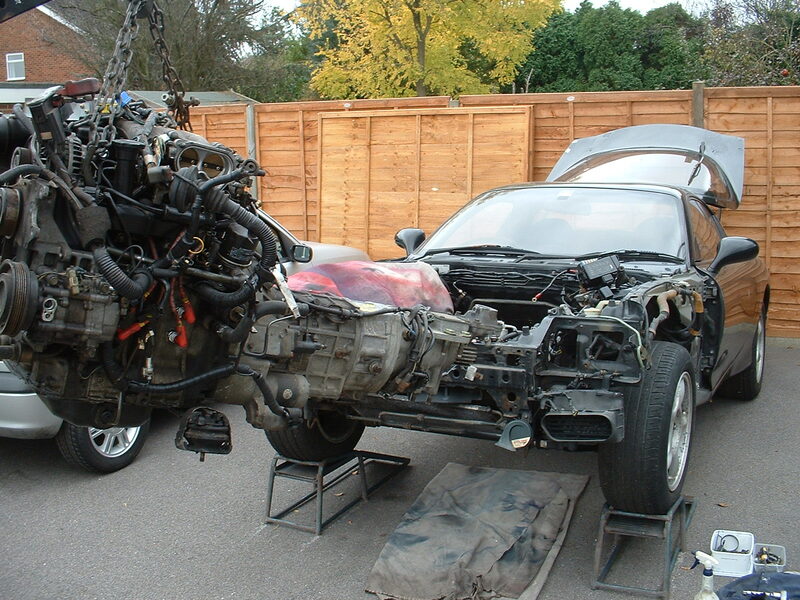 The full build can be viewed on the following links at the mazdarotaryclub forum: Stage1 – Initial build Stage2 – Cosmetic completion Stage3 – A quest for more power! Please enjoy these links and feel free to leave a comment here. I would also like to thank the guy’s at reworx for a great job tuning the car and rebuilding the engine! More details for them can be found in the recommended section. ive just had a ten min flick through your build log.to be honest i am gobsmacked on the time,money and energy you have put into it.i think the car is to good to be thrashed to death on track,and proberly a bit fragile to. im sure it would make an awesome weapon but fear i would spent more time under the bonnet than driving it. im sure you will sell it no problem to somebody who cleans there car more than they drive it! fantastic car,but i think i will look for a track ready beast.